I have always thought Mission would be a marvellous place to live. It has a grocery store, two drug stores, banks, restaurants, galleries, fitness and medical services galore. It has charming old homes, as well as low, mid and high rise condos (new and old). It even has its own elementary, junior and high school – not many City Centre communities in North America can boast that. There is a community garden and lovely pathways along the Elbow River too. Mission is home to numerous charming walk-up apartments like the Avonlea. It is also home to lots of new low-rise condos. 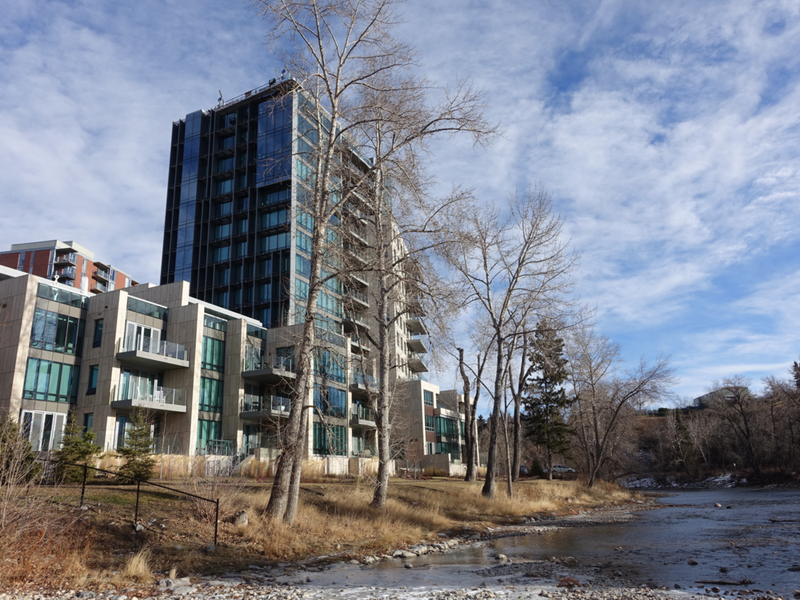 It is also home to multi-million dollar waterfront condos along the Elbow River. Fourth Street SW, Mission’s Main Street, extends from 26th Avenue to 17th Avenue SW and even beyond. It has a lovely diversity of pedestrian-oriented businesses - independent cafes like Purple Perk and Phil & Sebastian Coffee Roasters, upscale restaurants like Wurst and Mercato, neighbourhood pubs like Ducky’s and Joyce on 4th and one of Calgary’s oldest commercial art galleries - Masters Gallery. The Walk Score website gives Mission a Walk Score of 84, making it the 11th most walkable neighbourhood in Calgary. The only reason the score isn’t higher is because there is no LRT stop in the community otherwise, everything is within walking distance – downtown, Stampede Park, Memorial Park Library, 17th Ave shops and Repsol Sport Centre. Mission's La Boulanderie Bakery Cafe offers a little bit of Paris in Calgary. Purple Perk is one of Calgary's signature independent cafes. Frankly Heisler's Dream Fragment has weathered nicely outside the BMO branch on 4th Street SW.
Mission is home to St Mary’s Cathedral looks like it has been there forever but in reality only since 1956. The original St. Mary’s Church was a massive sandstone building with twin-domed towers built in 1889 and consecrated as a cathedral in 1913. The architect for the new cathedral, a modernist interpretation of Gothic architecture dominated by its 40-meter bell tower, was Maxwell Bates, best known as a highly respected painter whose art can be seen at Masters Gallery. Not many Calgarians are aware that tucked away at 141- 18th Street SW sits St. Mary’s Parish Hall, built in 1905 and sold to the Canadian Northern Railway in 1911, who converted the building into a train station which operated until 1971. It is now home of Alberta Ballet and its dance studio. 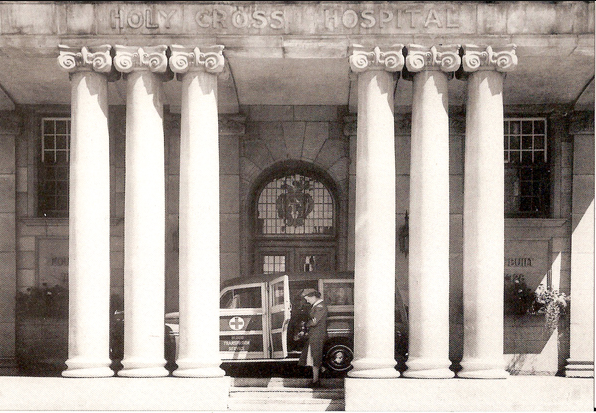 Mission was also home to Calgary’s first major hospital - the Holy Cross, built in 1892 and expanded in 1928 and 1950. Though none of the original hospital remains, the NcNabb wing, with its distinctive pillars built in 1947, still exists right on 2nd St. SW. 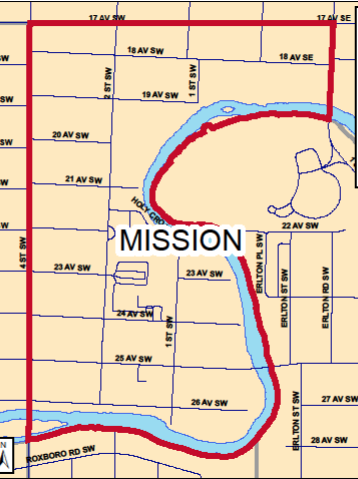 In an ironic twist, while Mission’s history is dominated by the Roman Catholic Church, Calgary’s Jewish community in 1930 acquired a site on Centre Street at 18th Avenue SW to build the House of Israel. However, it wasn’t until 1949 that the Art Deco building was finally completed and became the centre of Jewish life in Calgary. In 1960, the Tzedec Synagogue was built next door, but the “flight to the suburbs” in the late 20th century resulted in a new Jewish Centre in the community of Palliser in 1979. After sitting vacant for several years the Mission buildings were sold and transformed into condominiums in 1998. I love that the former street names have been added to the street signs as reminder of the history of the community. 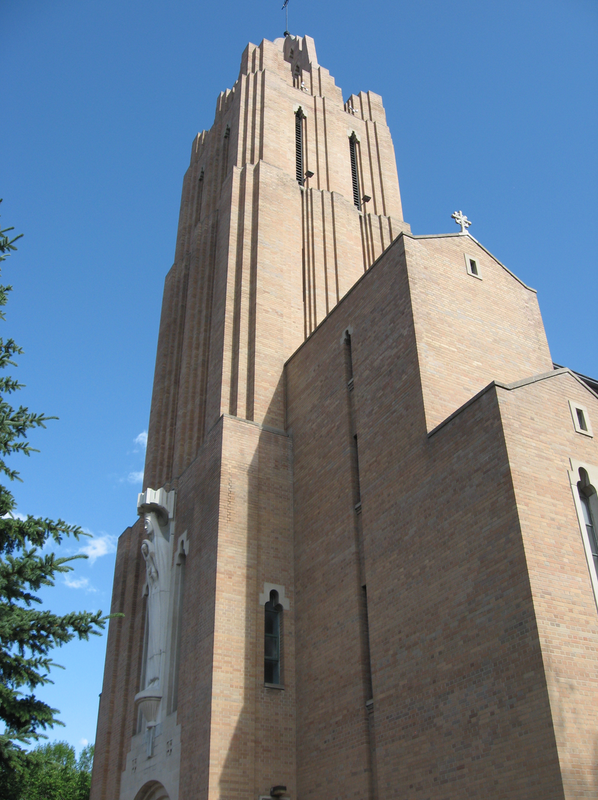 The new St. Mary's church. 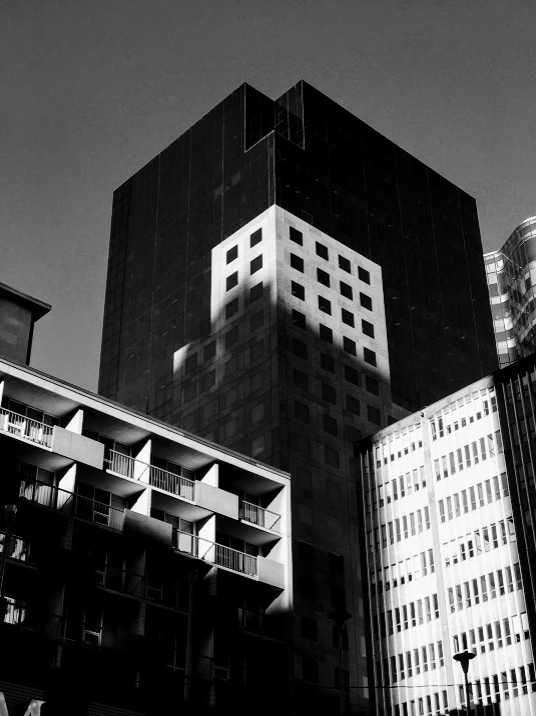 Built in 1973, the Mission Centre office building's curved architecture foreshadows that of the Bow Tower and has a better interface with the street. 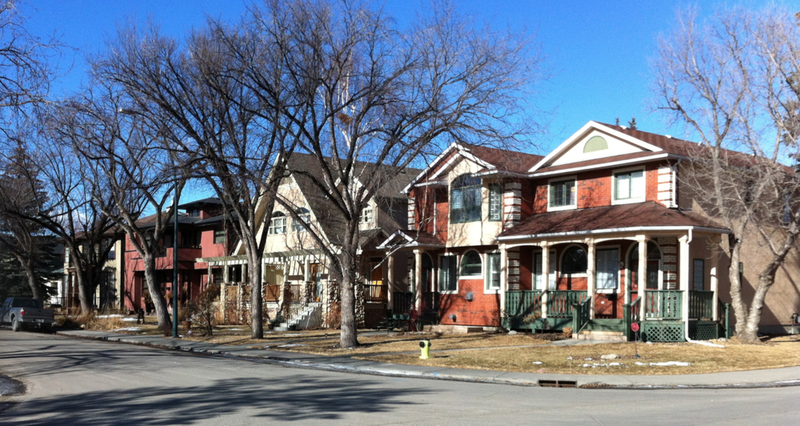 Mission is indeed marvellous and is an example of a Jane Jacob’s (late 20th century advocate for the importance of diversity and human scale development in creating vibrant inner-city communities) village in Calgary with its mix of old and new, affordable, modest and luxury homes along with shops that meet residents’ everyday needs. It is also home to several old and new office buildings which help to give it a buzz weekdays, as well as evenings and weekends. Watch for new Mission residential developments by Grosvenor on 4th St. at 17th Ave. SW and InDevelopments on the old Peking Dragon Site on 4th St. and 19th Ave. SW.
An edited version of this blog was commissioned for the January 2018 issue of Condo Living magazine. N3: No parking! No cars! No worries! I recently had a chance to tour Knightsbridge Homes’ and Metropia’s controversial new N3 condo in East Village, which has absolutely no parking for residents or visitors. While some saw the lack of parking as a huge risk in a city where most citizens can’t live without a car, Joe Starkman, President Knightsbridge Homes and his team did their research and realized while the market in Calgary for a condo with no parking was small, all he needed was 167 people in a city of over one million to sign up. Turns out he was correct. The 460 to 620 square foot condos were quickly snapped up. Today, the building is fully occupied with residents who love living East Village where almost everything is - or soon will be - within walking distance or a quick transit ride away. While the homes are small, I and the two other housing professionals I was with were very impressed with their efficient designed. While one might think N3’s market would be a haven for millennials, many were empty nesters. What I found really interesting too was that every buyer was given a $500 IKEA gift card to help outfit their condo, a Lifetime Car2Go Membership, $500 in Car2Go mileage credits and a $500 gift card to Bow Cycle. Obviously, N3 was destined to become a haven for walkers and cyclists, who only needed a car occasionally. I also learned a special weekend IKEA bus (hourly service starting at 11 am) was established not only for N3 but all East Village residents and the City Center at the N3 condo show suite – it still operates today. Calgary’s GEC architects designed a handsome building, which includes a spectacular roof top patio, complete with kitchen facilities and workout space. The patio has million dollar views of the downtown skyline, as well as great views of the new Central Library, the river and mountains. The rooftop patio was very well used this summer, becoming a communal living room for all residents. It is a view that will never disappear, as all of the surrounding buildings will never get any taller. 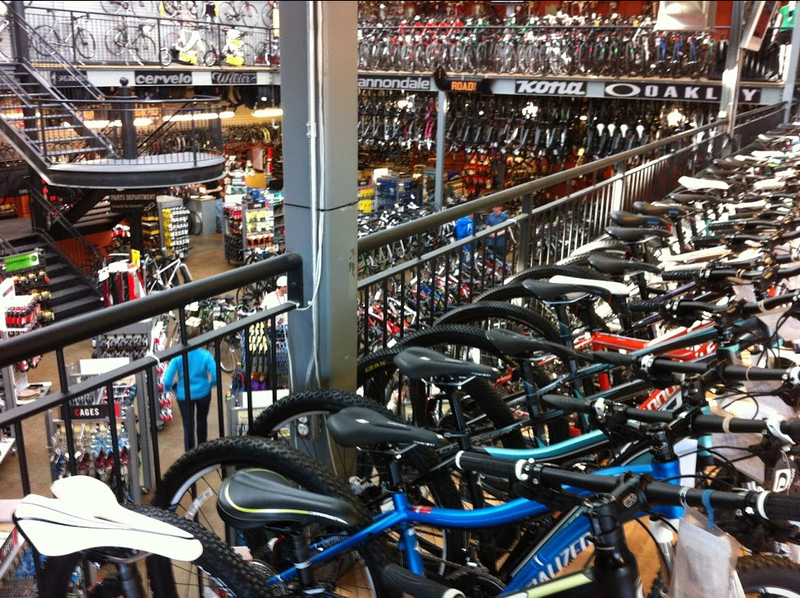 Its basement is probably the best bike storage in Calgary. It comes complete with a bike repair and washing area. There is direct access to the mews between N3 and St. Louis hotel with a bike friendly ramp and of course state-of-the-art secure storage racks. The bike room is bright and airy, not a dark and dingy basement. Like all good City Centre condo developments, N3 includes commercial uses at ground level. 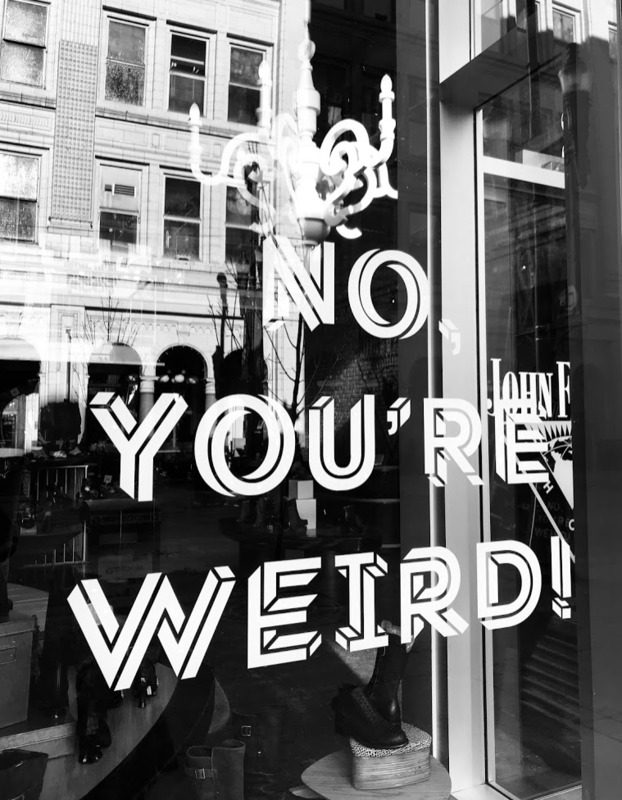 Tim Hortons has recently opened along the 4th Street SE street frontage while The Brewer’s Apprentice has opened in the mid-block mews that separates N3 from the historic St. Louis Hotel. Apprentice is a unique, high-tech concept that offers 48 different craft beers from Alberta and beyond. They offer tastings and in addition to buying beer in cans and bottles, you can get freshly poured growlers and tallboys. Kudos to the GEC architectural team who chose to make the entrance to N3 from the mews and not from 8th Ave SE or 4th St SE, thereby allowing for better commercial space at street level and a funky, European-like space in the mews. While N3 offered the lowest cost new condo prices in East Village and probably in all of the City Centre, it is by no means a low cost building. The amenities rival those of luxury condos. I chatted with several residents during my tour and everyone was very happy with their purchase. N3 has been so successfully Starkman and his team are going to “do it again.” Well, not exactly. They are currently developing plans for the 14-storey Velo, which will have a mix of housing types including mico-suites (under 250 sq. ft.), seniors’ housing and housing for the ably-disabled all in one tower. And yes it will have some parking but not the typical amount. As for the significance of the name N3, officially it stands for New attitude, New vision and New lifestyle, my interpretation is No parking, No cars, No worries! Note: An edited version of this blog was published in the Calgary Herald's New Condo section, Dec 23, 2017. Condo Living: More Time For FUN! 21st Century: Century of the condo! For decades now, I thought Calgary was the infill capital of North America. This belief comes not from any scientific-based research but rather from wandering the inner city streets of Austin, Denver, Chicago, San Diego, Montreal, Ottawa, Portland, Seattle, Vancouver and several other cities over the past decade. And in that time, I have not seen anything that compares to Calgary’s plethora of new homes being built in Calgary’s established communities. To be clear, I am not talking about infill condos but infill single family, duplex, triplex and row housing. New infill homes homes in Nashville's City Centre are very popular. It was surprising how many of the infill homes didn't have garages in Nashville and if they did often is was just a single car garage. At least, that’s what I thought, until I went to Nashville! After spending three days at the lovely Omni Hotel in the heart of downtown Nashville, we moved to an Airbnb in the trendy 12 South district, situated about 4 km from downtown. Across the street was a lovely new, two-story, single-family house while two doors down was an infill duplex not unlike what we would see in Calgary’s Altadore or Parkdale communities. Who knew I had chosen an Airbnb in the infill epicentre of Nashville! Not only were there new infill homes on almost every block, but the back lanes were filled with what they call “guest homes.” Most often these homes were built above the garage but in some cases they were completely independent homes. Nashville’s infill homes are known locally as “Tall Skinnys,” which was in fact what the earlier Calgary infills were often called. While Calgary’s infill housing dates back to the late ‘80s, in Nashville it is a relatively new phenomenon starting around 2010. However – and not surprisingly - communities there are protesting how infills are negatively changing the architecture of the communities. In true southern style, attractive early and mid-century brick, colonial and craftsman homes with lovely big porches on huge lots (it is not uncommon for lots to be 100 by 200 feet) populate Nashville’s established communities. It is vastly different from the cookie-cutter homes that were built in the ‘40s ‘50s and ‘60s in Calgary’s inner city. An example of a large corner lot with three houses (one old and two new) with room still lots of grass. Note: no sidewalk. An older duplex with the umbilical cord attachment between the two new houses. As I wandered, I also noticed many of the new infill houses had strange connections between them, including one that looked like a +15 bridge. Fortunately, the city has cut the “umbilical cord” and they are no longer required. In the 12 South community, a new heritage bylaw no longer allows developers to demolish an old house. Instead, they have to renovate and incorporate it into the new larger home which often becomes a duplex with one home facing the street and one the back alley. In some cases, three homes can be squeezed onto a corner lot. Construction of two houses on one lot, one at the front and one in the back. Note there are no basements in most Nashville homes. An older home being renovated with the addition of second floor and new home at the back. Nashville’s skinnys are also made to appear skinnier by design elements that accentuate the vertical nature of the homes. Most have steep pitched, gabled roofs. The siding is often installed vertically rather than horizontally creating an even more of a sense of height. This could easily be in any one of dozens of Calgary's inner-city communities, but this is in Nashville's 12 South District. Some have both a porch and balcony above, resulting in pillars or posts that give the home’s façade a more vertical thrust. For some reason, almost all homes in Nashville are built several feet above the roadway even though they don’t have basements. In effect, this can add another half story to the house, creating a taller effect. New homes at the front and at the back of the lot create four new homes on one large lot. Vertical siding is also quite common in Nashville. It is very common to have a few step at the sidewalk to get up to the front lawn and then more steps at the house help enhance the image of a tall skinny house. We love to get off the beaten path, which one day included a bus transfer in the Gulch community (aka Calgary’s East Village) where we decided to wander a bit before catching the next bus. Crossing under an overpass, we encountered the strangest City Centre infill project I have ever seen. It was a completely new subdivision with tiny identical homes on huge lots, all with manicured lawns, no fences and not a person in sight. It was a surreal, pastoral suburban-looking community sitting just blocks away from new highrises. Turns out it is a public housing project that replaced an older inner-city apartment project. It seemed such a waste of land in the middle of the city. New City Centre infill community in Nashville. You can see the new condo and office cranes in the distance. Nashville has nothing to compare to Calgary's mega East Village, Currie or University District urban villages. 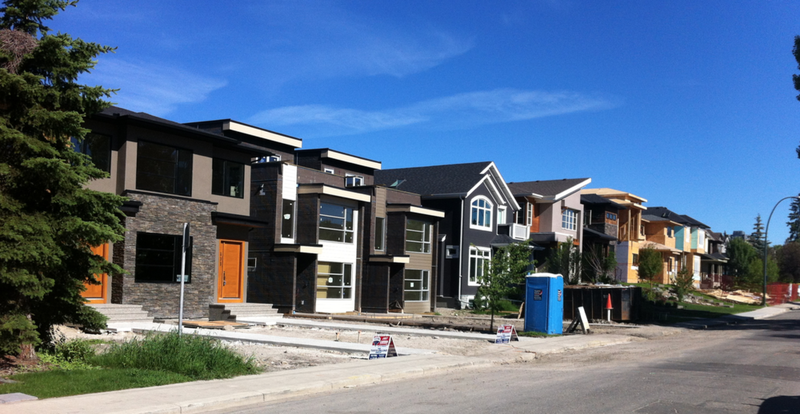 Since 2012, 4,876 new infill homes (single and duplex) have been built in Calgary. By the end of September 2017, already 659 new infill homes have been built or are under construction. Altadore leads the way with 421 new infills, followed by Killarney/Glengarry (368), Mount Pleasant (346), Richmond (229) and West Hillhurst (208). Wandering more streets in other communities around Nashville’s City Centre, it was obvious that while infill housing is happening in all of its established communities, 12 South is the epicentre. I contacted Craig Owensby, Nashville’s Planning Department’s Public Information Officer to see if I could get similar stats for Nashville, but unfortunately they don’t keep records of infill development as a separate sub-category for new builds. Note: An edited version of this blog was published in the Calgary Herald's New Homes section on Saturday, November 25, 2017. Calgary's inner-city communities were dominated by these small single story homes on 50 by 120 foot lots until the 1980s when new infill homes started to become popular. This street in Parkdale is on the block immediately west of the one above. It is lined with new infills that illustrate the diversity of infill designs that can be found in Calgary. This is a street in Calgary's Hillhurst community, it looked like a suburban parade of show homes when I took the photo a few years ago. These homes are very popular with young families, which helps to revitalize established communities, creating a healthy inner-city. Today, even in a recession there are new infill homes being built on almost every other block in all established communities within 5 to 10 km of downtown. Intelligent Infilling or Do we live in a bubble? 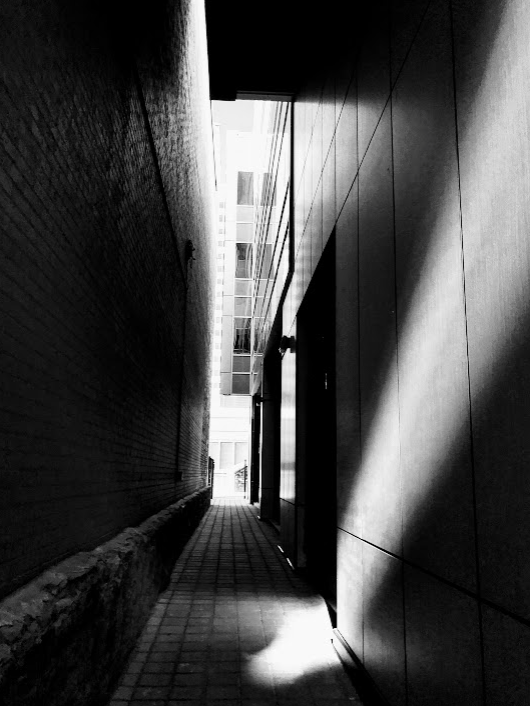 Over the past few weeks I have enjoyed exploring the streets and indoor +15 walkway of Calgary's downtown searching for dramatic lighting for black and white photos. 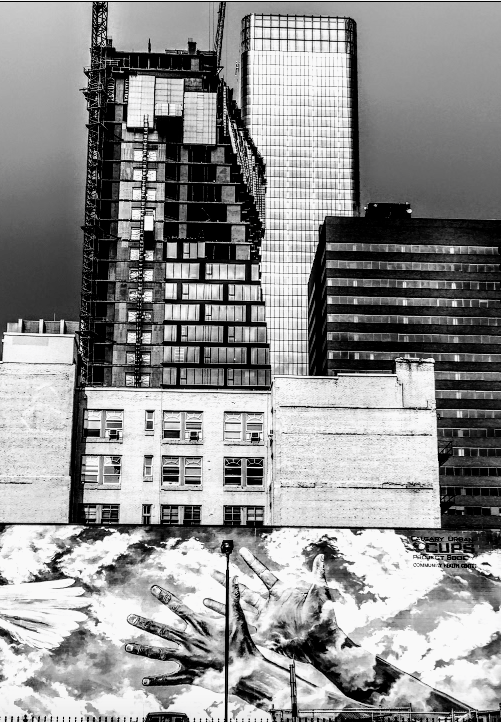 In addition, I was attempting to capture Calgary's unique urban sense of place. Hope you enjoy this photo essay - feedback is always welcomed. On paper Calgary and Nashville share many similarities. Both are inland, river cities, next to major parks and mountains and have a metro population of about 1.5 million. Perhaps most importantly both also have international signature brands - Nashville as the home of country and western music and Calgary as the home of the Calgary Stampede. Assuming the City Centre is the heart and soul of a city, I thought it might be interesting to see how the two City Centres compare with each other. A view of the Nashville skyline from our luxury Omni Hotel suite. A view of Calgary skyline from the N3 condo rooftop patio with the new Central Library in the foreground. Like Calgary Nashville has a major railway line running through its City Centre. This coal train is the equivalent to Calgary's bitumen trains. 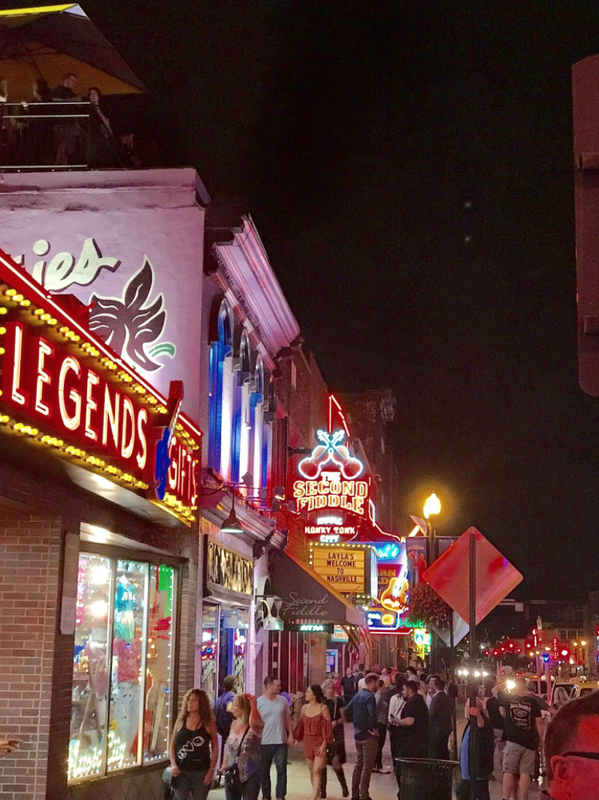 Lower Broadway, Nashville’s signature street is animated from 10am to 3am 365 days of the year with free live music being offered in 25+ honky tonk bars. In comparison, Calgary’s Stephen Avenue is busy mostly over weekday lunch hours when thousands of office workers head out for a bite to eat (25+ upscale restaurants) or a relaxing walk. While Stephen Avenue is a conservative upscale restaurant row, Lower Broadway is loud, fun-loving gritty urban playground which every weekend is invaded by dozens of Bachelorette Parties. Nashville's main street is animated all day long, but really comes alive at night - every night not just on weekends. While Nashville's City Centre is undergoing a massive makeover, lower Broadway is still an eclectic collection of gritty buildings from yesteryears. 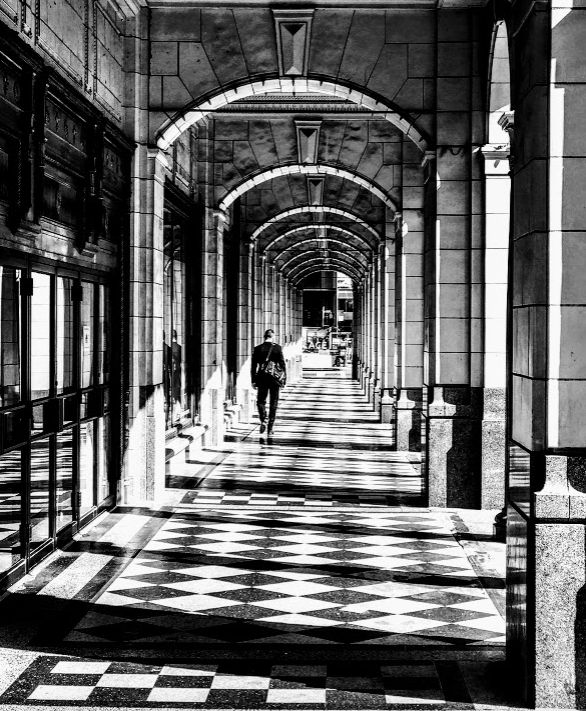 Calgary's Stephen Avenue comes alive in the summer at noon hour and all day during Stampede but for most of the year it is very subdued, especially on weekends when the office towers are empty. It is unique in that it is a pedestrian mall by day but has one-way traffic at night. It connects the Olympic Plaza Cultural District with a national historic district and Calgary's Financial District. 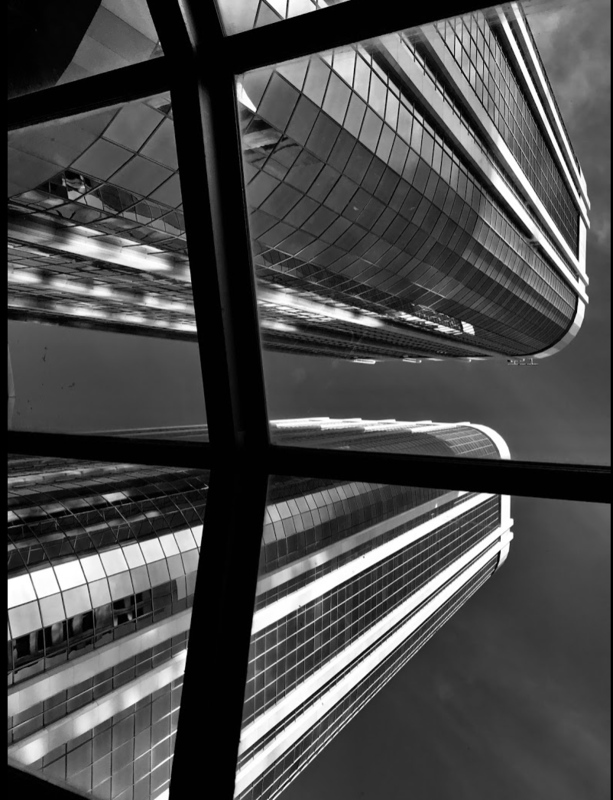 The 300 block of Stephen Avenue has been called centre ice for Calgary's CBD with its 200 floors of corporate offices in six office towers. Nashville has nothing to match The Core, Calgary’s urban retail mecca, nor does it have a signature department store like The Bay. 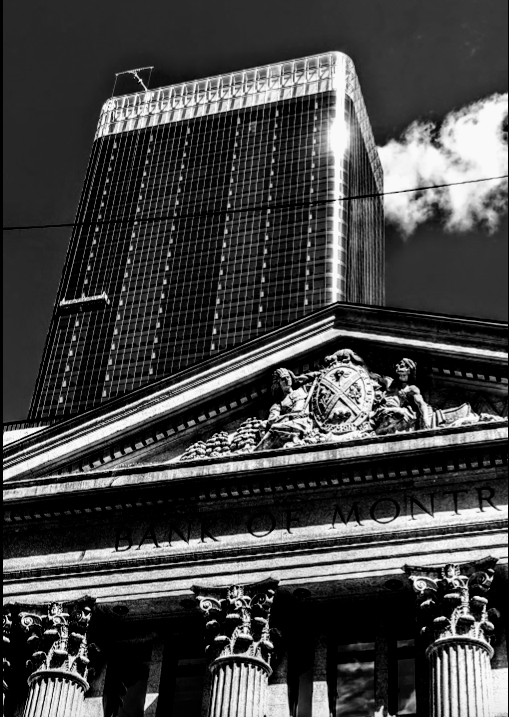 It is also missing the office tower retail offerings of a Bankers Hall, Bow Valley Square or Scotia Centre. Nashville has nothing close to the pedestrian experience offered by Calgary’s 17th Avenue, 11th Avenue, 4th Street, Atlantic Avenue, 10th Street and Kensington Road. Nashville has nothing to match Calgary's three block long Core shopping centre in the middle of its downtown. Calgary's 17th Avenue is just one of several pedestrian streets in its downtown. 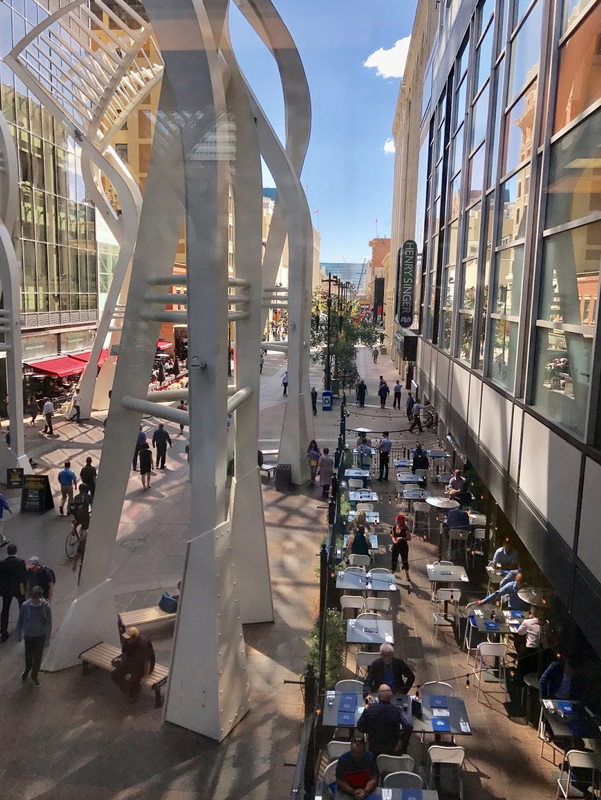 Calgary's Kensington Village has two pedestrian streets with a mix of retail and restaurants that appeal to both students at Alberta College of Art & Design and Southern Alberta Institute of Technology as well as oil & gas, medical and university professionals. 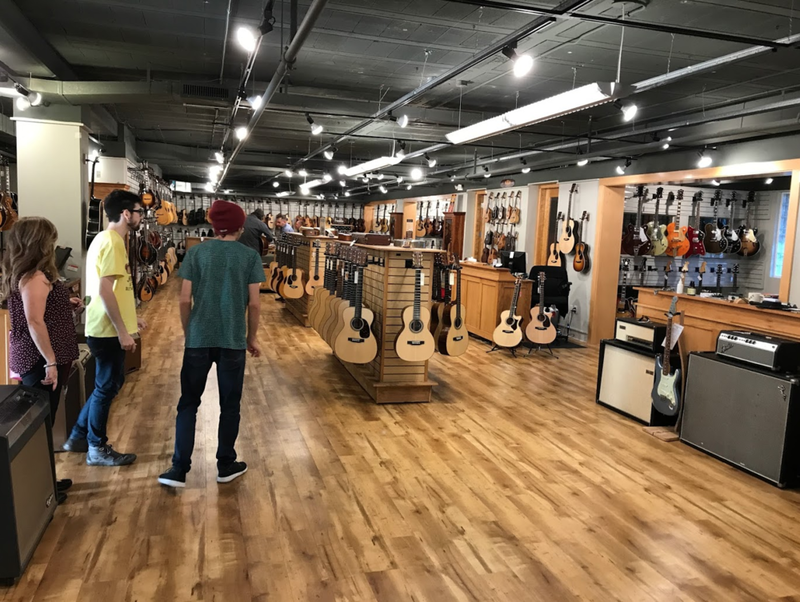 Nashville has several guitar and music stores located in its City Centre, perhaps the most iconic is Gruhn Guitars. Guitar shops are to Nashville what bike shops are to Calgary. What Nashville does have is a plethora of cowboy boot stores like French's Shoes & Boots. The Sutler is just one of many popular weekend brunch spots in Nashville along emerging 8th Ave South district. I was shocked at how busy Nashville’s museums and art galleries were even during the week. Perhaps this is not surprising as Nashville attracted 13.9 million visitors in 2016 vs. Calgary’s 7.2 million. While on paper Nashville’s new Country Music Hall of Fame and Calgary’s National Music Centre are on par, Calgary lacks the likes of the Johnny Cash, Patsy Cline and Musicians Hall of Fame Museums. They also have an African American Music Museum under construction. Calgary’s Glenbow would be on par with the Frist Art Gallery (located in Nashville’s Art Deco fromer Post Office) and Tennessee State Museum. Nashville also has the Ryman Theatre the original home of the Grande Old Opry, which today offers daily tours and headliner performances in the evening. Calgary’s Palace Theatre pales in comparison as a tourist attraction/cultural icon. Both cities have a performing arts centre, symphony hall and central libraries that are more or less on par with each other. 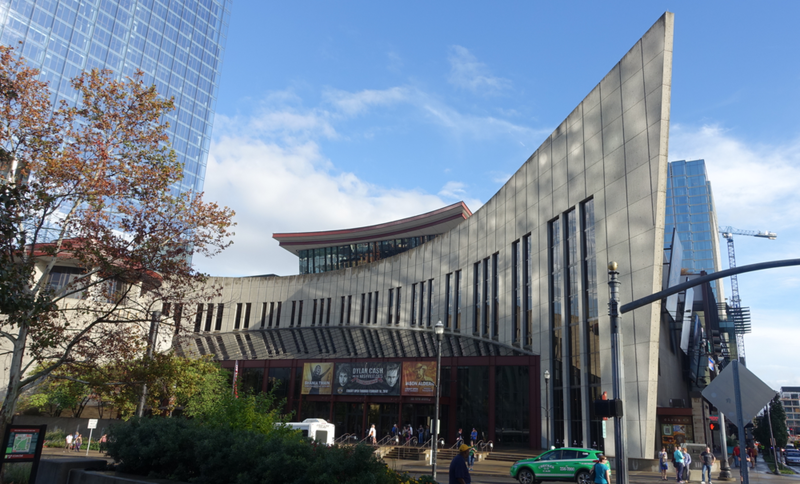 Nashville's Country Music Hall of Fame & Museum is the heart and soul of its downtown. It is busy seven days a week. Nashville has several music museums and two Hall of Fames. The Musicians Hall of Fame and Museum was particularly enlightening as it told the story of the studio musicians who are the backbone of the Nashville music industry. 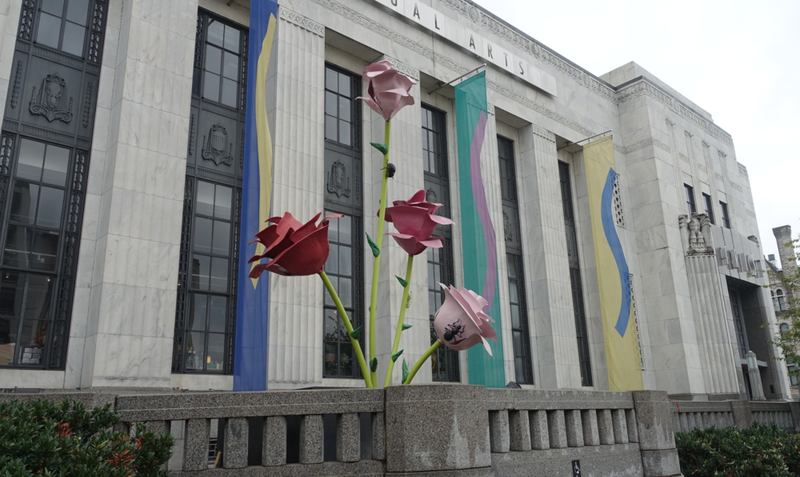 Nashville boast a lovely art deco public art gallery. 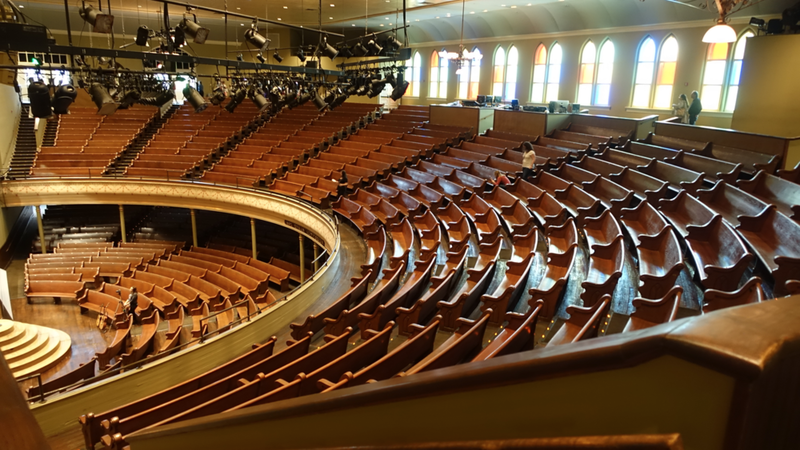 Nashville's Ryman Auditorium is the mother church of the city's music industry. 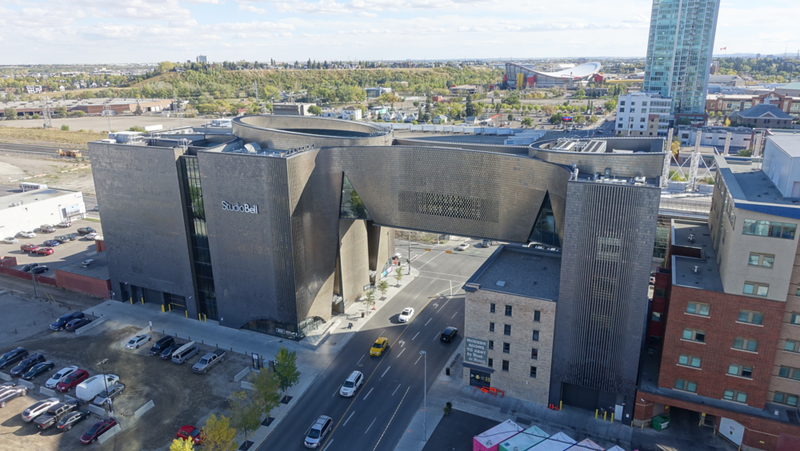 Calgary's National Music Centre is part of a growing east side cultural community that includes the new Central Library, DJD Dance Centre and Youth Campus at Stampede Park. 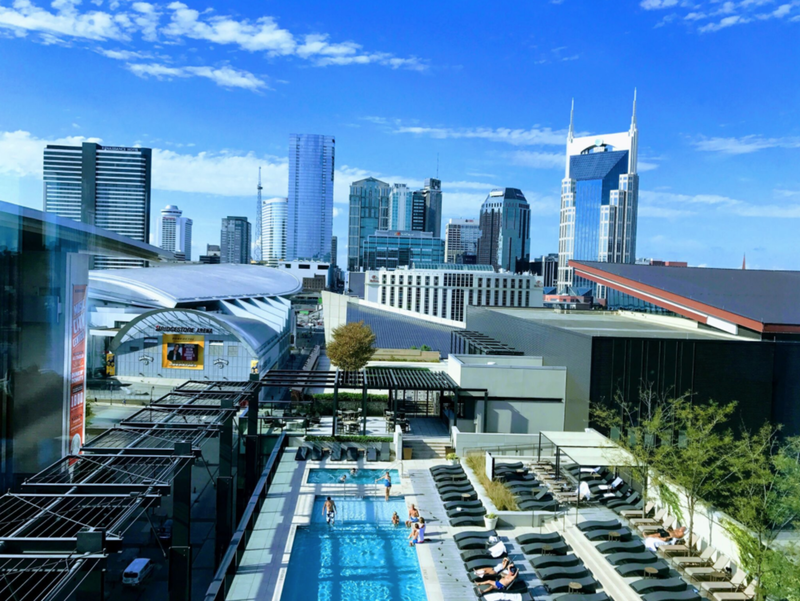 Calgary has nothing to compare to Nashville’s 800 room Omni Hotel, a luxury urban resort attached to the Country Music Hall of Fame and Museum. Our executive suite offered a postcard view of the downtown. It was a true urban oasis. Nashville also has two heritage hotels compared to Calgary’s one. And we were gobsmacked by the professionally curated contemporary art exhibition at the 21c Museum Hotel. Nashville’s new mega convention centre makes Calgary Telus Convention Centre look second class. Even if when you add in the BMO Centre, Nashville’s Convention and Trade Show facilities far surpass Calgary’s. The Music City Convention Centre is massive, however, the streets devoid of any vitality most of the time. 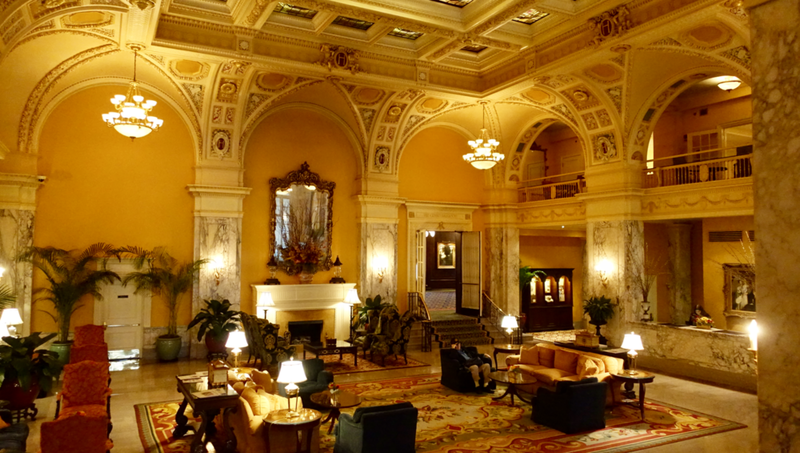 The lobby of Nashville's Union Station Hotel (yes, it is a converted historical railway station) is impressive. Nashville has nothing to match Calgary’s river pathways with its plethora of walkers, runners and cyclists 365 days of the year. Nor does it have anything to match Calgary’s recreational facilities - Eau Claire Y, Repsol Sports Centre or Shaw Millenium Park. I also didn’t encounter anything in Nashville that compares to Calgary’s island parks or Memorial Park. Calgary's recently renovated St. Patrick's Island is lovely family friendly park in the middle of the Bow River. 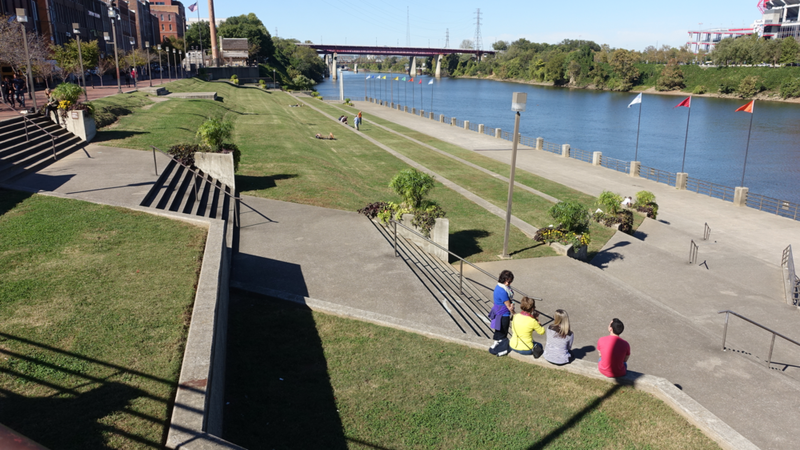 Nashville has a lovely green beach along the Cumberland River, but it lacks the pathways along the river to link the City Centre to rest of the city. Calgary's equivalent to Nashville's green beach would be the East Village plaza along the Bow River. Nashville has nothing to match the love tree-lined City Centre river pathways along both the Bow and Elbow Rivers. Memorial Park is one of many City Center parks in Calgary. Calgary's City Centre boast dozens of children's playgrounds. I did't see a single playground in Nashville's City Centre. Nashville has nothing to match the enhance public spaces of Calgary's City Centre like Olympic Plaza. Nashville’s 20-year old Bridgestone arena is very much integrated into their downtown – right next to Lower Broadway street animation and across the street from the convention centre. However, the streets around it are devoid of any pedestrian activity except for a few hours before and after game times. Calgary’s Saddledome arena is on par with the Bridgestone arena in architecture and size. With better programming (food trucks and live bands) and marketing I expect Olympic Way could function like Lower Broadway to create a more animated streetscape on game days. Nashville’s Nissan stadium, located across the river from Lower Broadway, is surrounded by a huge vacant parking lot except for the eight Sundays when the Titans have a home game. Calgary’s McMahon Stadium, while smaller, functions much the same way being used just a few times a year. At least the parking lot at McMahon Stadium is used for “park and ride” during the week. The entrance to Nashville's Bridgestone Arena built in 1996 is located right downtown on lower Broadway aka Main Street. Nashville's Nissan Stadium opened in 1999. It provides a nice vista but it has not been a catalyst for development on the surrounding land. Calgary's Stampede Park located at the southeast edge of the City Centre is not only the City's fairground but it is also home to the iconic Scotiabank Saddledome and the BMO Centre which hosts major trade shows and conventions. 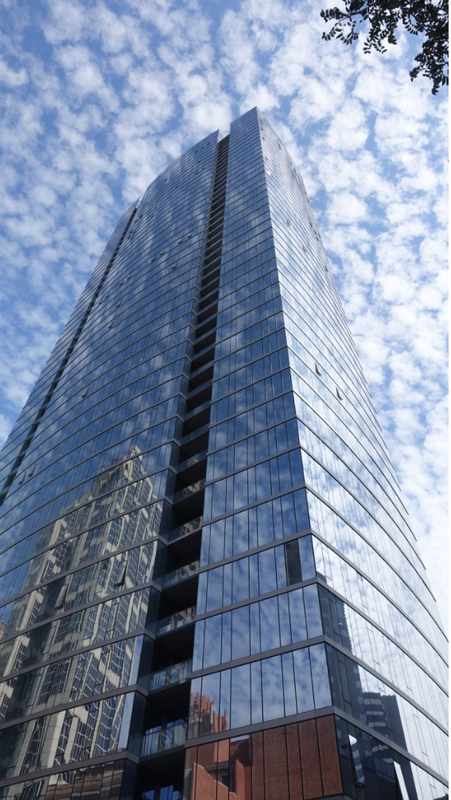 While, Nashville has several new contemporary glass office towers that would be on par with Calgary’s Brookfield Place or 707 Fifth, however they lack the integration with street via plazas, public art and retail. I encountered nothing in Nashville that match Calgary’s two new iconic pedestrian bridges and the historic Centre Street bridge. Yes, Nashville has a huge historic truss bridge completed in 1909 that spands the Cumberland River and at 960m it is one of the longest in the world, but I rarely saw anybody use it at there is little on the other side of the river except the stadium. When it come to public plazas, Nashville had two – the Courthouse Square above parkade and the Walk of Fame Park next to the Country Music Hall of Fame and Museum. Calgary’s equivalent would be Olympic Plaza, James Short Park and McDougal Centre. Nashville has no LRT, and their bus service pales in comparison to Calgary. 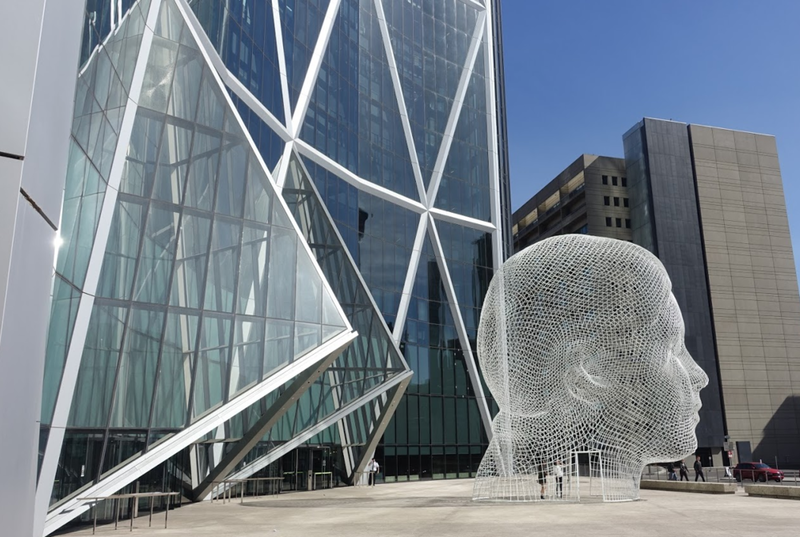 Calgary's Jaume Pensa sculpture "Wonderland" sits on the plaza of the 58-storey Bow Tower designed by Sir Norman Foster. Nashville's Plensa sculpture "Isabella" is located at the Frist Center For The Visual Arts. Perhaps the contrast between these two public artworks best manifest the differences between Nashville and Calgary. Nashville historic pedestrian bridge links the City Centre to the Nissan Stadium. Calgary has several pedestrian bridges linking the north and south shores of the Bow River like the Santiago Calatrava design Peace Bridge that is very popular with runners and cyclists. 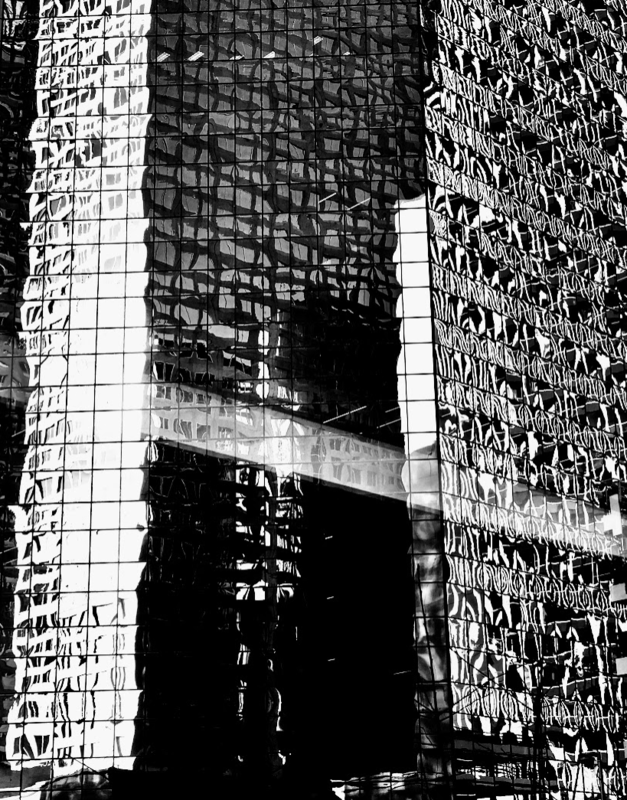 Both Calgary and Nashville have ubiquitous modern glass facade office towers. Nashville has nothing to match Calgary's LRT system and our 7th Avenue Transit Corridor. Like Calgary, Nashville is experiencing an urban living renaissance with dozens of new condo developments in its City Centre. The Gulch is Nashville’s equivalent of Calgary’s East Village – minus the huge investment in public amenities. Inglewood/Ramsay with its numerous music and bohemian venues parallels East Nashville. Nashville’s upscale trendy 12 South is similar to Calgary’s Britannia. Calgary’s Kensington Village would be on par with 21st Ave S near Vanderbilt and Belmont Universities. Marda Loop would be Calgary’s equivalent to Nashville’s 8th Ave S district. What Nashville doesn’t have is anything to match Calgary’s vibrant Beltline, Bridgeland or Mission communities. Calgary's East Village is in the middle of multi-billion dollar makeover to accommodate 10,000+ residents. Nashville Gulch district is the equivalent of Calgary's Beltline with a mix of new residential, retail and office development. Calgary's Beltline community is home to 22,000+ residents and four pedestrian streets - 11th Avenue, 11th Street, First Avenue and 17th Avenue. Nashville has no City Centre community of this size and diversity. East Nashville is similar to Calgary's Inglewood/Ramsay with a mix of new condos and working-class homes. It has numerous pedestrian hubs, but no contiguous pedestrian streets. Nashville has nothing to match Calgary's plethora of new high-rise condo buildings. Nashville has nothing to match Calgary's cafe scene. Calgary has nothing to match Nashville's live music scene. Calgary and Nashville’s City Centres are as different as night and day, as different as engineers and musicians. Calgary’s has a clean, conservative, corporate sense of place, while Nashville’s is a gritty, party, touristy place. Calgary’s City Centre is a calm HQ (headquarters) quarter, while Nashville’s is a chaotic SHED (sports, hospitality, entertainment, district). Each has its inherent advantages and disadvantages. Cities can’t be all things to all people. Note: An edited version of this blog was published in the Calgary Herald's New Condo section on Nov 11, 2017. Calgary vs Seattle: Capturing the tourists' imagination! Calgary: Off The Beaten Path For Tourists! 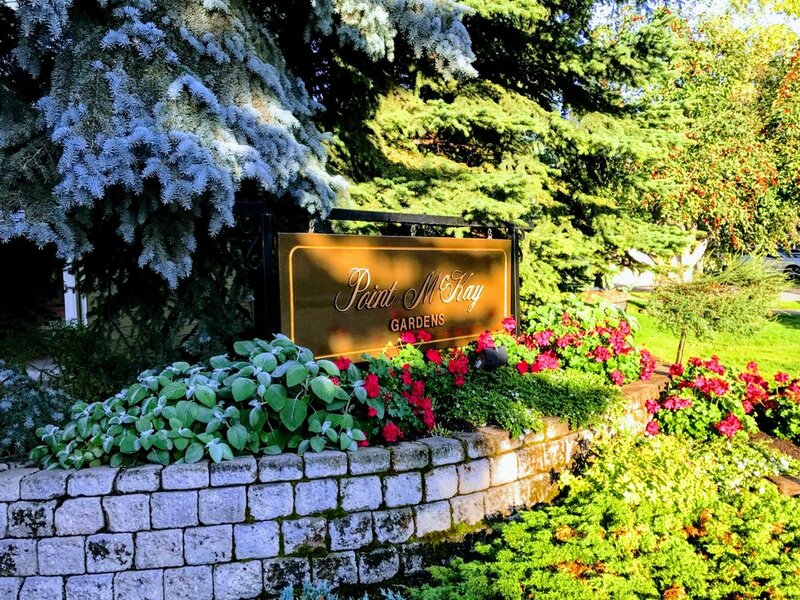 Many times I have said “don’t judge a community until the trees are taller than the houses.” I was reminded of this over the summer as I picked up a golf buddy once a week at his townhome in Point McKay before heading out to Redwood Meadows. As the summer unfolded, so did the amazing trees and flowers that make the northwest community of Point McKay a garden paradise. It is bounded at the north by Bowness Road, at the east by 37 Street NW, at he south by the Bow River and at the west by the Edworthy Park parking lot. For many, Point McKay is the two brown brick highrise condo towers (Riverside I and II) along Parkdale Boulevard next to the Edworthy Park parking lot, or the townhome backyards you can see when you walk or cycle along the north shore of the Bow River. In reality, it is a hidden gem. Point McKay was one of Calgary’s first attempts at creating an urban village. The 21- storey Riverside I and II towers (completed in 1979 and 1981 respectfully) create the high density (295 units) with retail and a fitness centre at street level they are similar in many ways to the new towers in the Beltline. It isn’t until you drive into the townhome area to the east of the towers that you begin to appreciate how this urban village is a garden oasis. The curved, tree-lined streets are divided into six clusters (built from 1977 to 1980) totalling 505 town homes and 30 duplexes. What makes them really special is the lovely side and backyards that open up to common areas lush with flowers, trees and expanses of green grass. There are no detached single-family homes in Point McKay, the same as University District one of Calgary’s new 21st century urban villages, currently being built just a few kilometers away. Lush garden pathways create pastoral backyards. Best side yards in Calgary? One Sunday afternoon, I cycled over to explore the community on foot. I was gobsmacked by how beautiful the side yards and interior common areas were. I was immediately reminded of the “City Beautiful” movement popular in Canada in the early 20th century, with its principles of creating urban communities that were less grid-like and more park-like. This meant curved streets, irregular lot shapes, boulevards, an abundance of parks and architectural controls; not dissimilar to what we saw in Calgary’s late 20th century communities. View of Point McKay from the Bow River pathways (north side). Point McKay has easy access to the Bow River pathway - for cycling downtown to work and/or play, or perhaps a recreational walk in the evenings or on weekends. You could walk to work if you worked at the Foothills Medical Centre. It is also close to both Edworthy (pebble beach) and Shouldice (sports fields) Parks. It is also only a short walk to Angel’s Cappuccino & Ice Cream café in Edworthy Park or the Lazy Loaf Café, Extreme Bean or Lic’s Ice Cream in Parkdale. 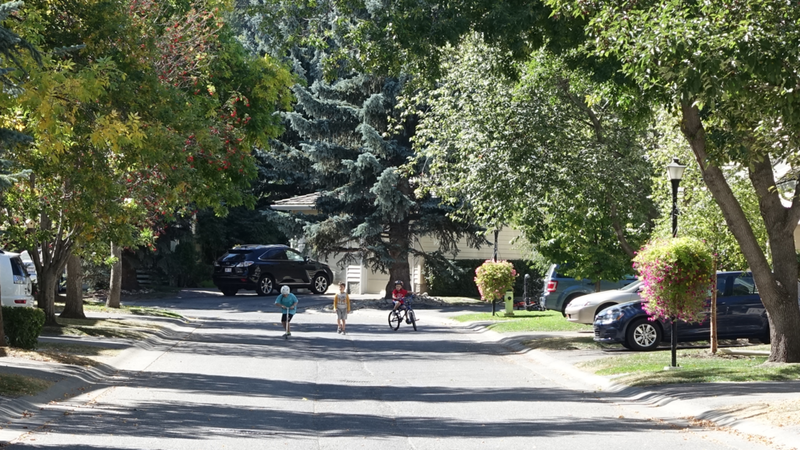 Cottage-like streets are child friendly even without sidewalks. In 1977, Cinema Park Drive-In, with its parking lot that accommodated 1036 cars, was demolished to make way for the Point McKay upscale high-rise/townhouse development. The development is named after Alfred Sidney McKay (1860–1940), a Calgary who homesteaded the land that is now Point McKay and Parkdale. He built a sandstone home near the Bow River at 1st Ave and 37th St NW that is still there today albeit hidden in the middle of Point McKay and rented to an architectural firm. Yes you can still walk in and see it. FYI: There are also four 100 year old brick homes along 37th Street that were built as a parade of show homes when the new community of Parkdale was McKay built as show homes when he was first being developed. Today, Point McKay is home to some lucky 1,348 people who live in a garden paradise that is unique to Calgary. Note: This blog was originally published in the November 2017 Issue of Condo Living Magazine. Don't Be Too Quick To Judge! West District: An Urban Village in the 'burbs? It all happened so innocently. I saw a tweet inviting East Village residents to visit the National Music Centre (NMC) free on Sunday, August 6th and tweeted back “Why were only East Village residents getting in free?” I was quickly bombarded with tweets and an interesting twitter conversation ensued over the next 10 hours. Some thought it was a great idea, given East Village residents have had to put up with construction for so many years. Others thought it would be great for the seniors living in the affordable housing complexes who can’t afford regular admission. Yet others like me, thought it was strange that one community had been singled out for free admission. Studio Bell or National Music Centre is a massive building that has attracted significant attention from the international design community for its unique shape and design. 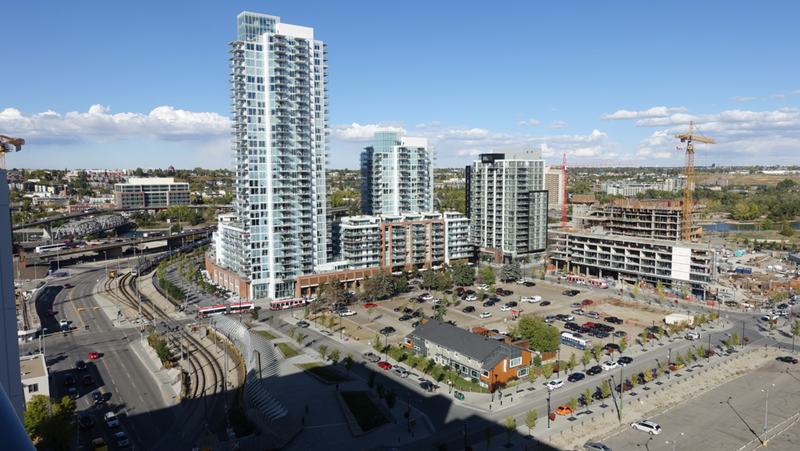 Calgary's East Village is perhaps one of the largest urban construction sites in North America with several new condos, hotels and retail developments, as well as an iconic new library currently under construction. On Monday morning, I checked with the National Music Centre to learn what the rationale was for free admission for those living in East Village only. Turns out the free admission was sponsored by Calgary Municipal Land Corporation (CMLC), the city body responsible for managing the redevelopment of East Village and one of the investors in the Museum. In 2017, CMLC has a $1.5 million dollar budget just for Community Relations and Marketing - no other community in Calgary has anything near that, not even ones with a Business Improvement Area levy like downtown, 17th Ave, Kensington or 4th Avenue. In fact, no community in Calgary has received as much municipal investment in such a short time as East Village. Yes, some of the investment like St. Patrick’s Island Park and Central Library are citywide amenities, but if that is the case, then the Rivers District Community Revitalization Levy (RDCRL) probably shouldn’t fund them. Riverwalk has become a very popular place on the weekends for people to sit and stroll. It has been heavily programmed by CMCL as a marketing strategy for selling condos. 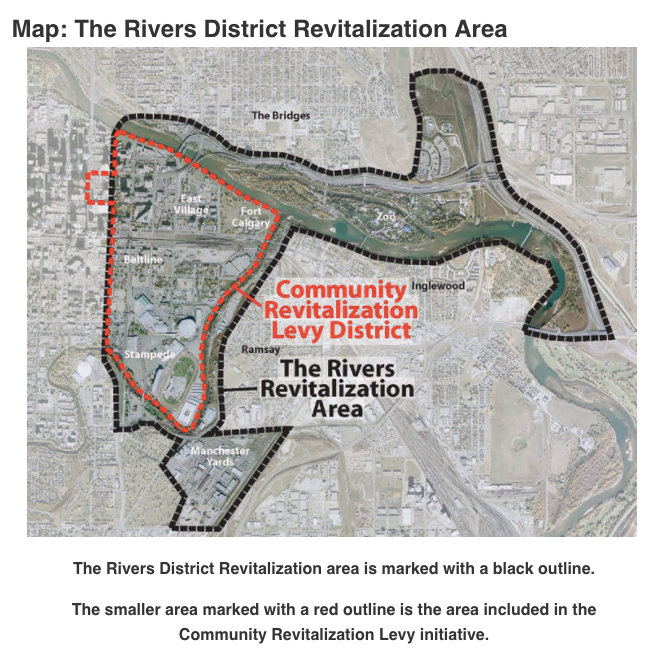 To accomplish the mega makeover of East Village, the City of Calgary set up a special Rivers District Community Revitalization Levy in 2007. To date City Council has authorized $276M (additional revenue has been generated by the sale of city owned land in East Village) to be borrowed to make all the necessary infrastructure and other improvements needed to create a 21st century urban village, with the loan payments being paid for by the new property tax revenue from new developments. The RDCRL boundaries not only include East Village, but Victoria Park and Stampede Park and downtown. CMLC has done an amazing job of the mega makeover of East Village converting it from a sea of surface parking lots, a prostitute stroll and drug dealers’ den to a haven for YUPPIEs and empty nesters. To date, CMLC has attracted $2.7 billion of new construction in East Village which has generated the $357 million in levy revenues and it is anticipated to be whopping $801 million by 2027 when the RDCRL expires. Calgary's "float boat" shaped Central Library with its playful geometric decals is destined to become Calgary's newest postcard to the world. How has the $357 million been invested to date? The first wave of projects were budgeted at $143 million for infrastructure improvements (raising the roads, sewer, environmental clean-up and new sidewalks) $55 million for the 4th Street Underpass and $23 million for phase I & II of RiverWalk. St. Patrick's Island has been transformed from an under utilized, almost forgotten park, into a wonderful urban playground for the growing number of families living in the City Centre. The second wave of projects were less infrastructure projects and more about making East Village a 21st century urban playground. Specifically, the St. Patrick’s Island makeover cost $20 million plus $25 million to replace the existing pedestrian bridge. There was $22 million to restore historical buildings, $70 million to the New Central Library once it was decided it would be located in East Village (total cost of the new library is $245 million) and $10 million to the National Music Centre. Bloom by Michel de Broin is just one of several public art pieces (permanent and temporary) that CMCL has commissioned for East Village. As well, smaller projects included the Elbow River Traverse pedestrian/cycling bridge ($5 million), C-Square, a plaza along the LRT tracks designed as a passive gathering / small event space ($3million) and a community garden with 80 plots ($75,000). Collectively, all of these projects convinced developers the new East Village was an attractive place to invest and they have worked with CMLC to transform East Village from an urban wasteland to an urban playground. Excerpt from CMLC 2017 - 2019 Business Plan. Is $357 million too much? While I appreciate East Village was woefully ignored by the City for many years and therefore in need of a huge investment to kick-start the redevelopment, I think the investment of $357 million by the City of Calgary via CMLC in one community is excessive. When I pointed out to Calgary’s Twitter community that while East Villagers have indeed put up with a lot of construction, they have gotten - or are getting - a lot in return – spectacular new library and museum, beautiful new RiverWalk, lovely sidewalks with hanging baskets, a wonderful redeveloped park, new playground and an upscale community garden, I was (not surprisingly) lambasted by some and applauded by others. 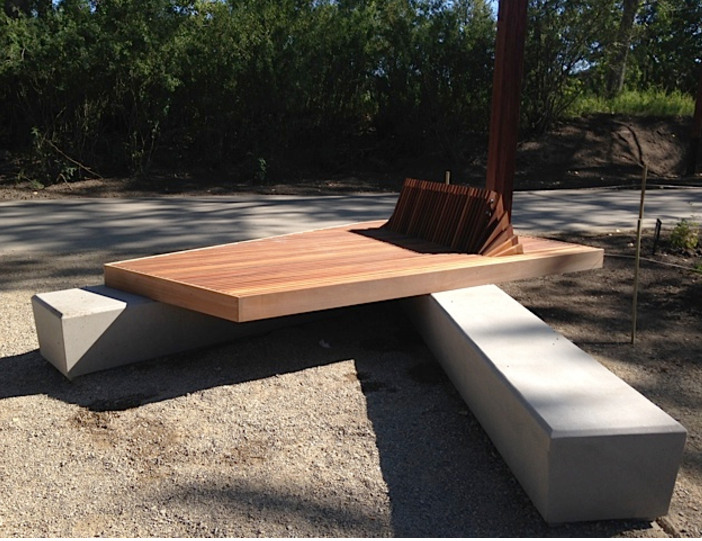 These benches in St. Patrick's Island have a contemporary sculptural look with the mix of wood, concrete and minimalist sensibility. The design is very clever as one person can be lying down on one side while two people can be sitting on the other side of the back support and two more on the concrete slab. Not that I have ever seen that happen. Wouldn't they be lovely in parks across the city? Indeed, the first wave of East Village projects were much needed infrastructure improvements – raising the roads, new underpass to connect to Stampede Park, flood protection, new water and sewer lines and sidewalks (about 50% of investments to date). I do not blame CMLC. They have done an amazing job. But I am questioning how much taxpayers’ money has been invested in East Village to create a public realm that raises the bar way beyond what the City can provide in other communities. These summer chairs look like something you might find on a cruise ship. They create a very welcoming sense of place along the Riverwalk. It is very possible the next wave of RDCRL projects could be a new arena in Victoria Park and an expanded convention/trade show centre in Stampede Park. They will be the equivalent of East Village’s Central Library and National Music Centre. Other projects included in Nenshi’s Bold Plan include renovations to Olympic Plaza (Riverwalk), Expanded Arts Commons (St. Patrick’s Island/Bridge) and Victoria Park development (Traverse Bridge). Indeed, the Calgary Sports and Entertainment Corporation is lobbying the City to create a CRL to fund their new arena/events center be it in Victoria Park or West Village. I ask – “Is this the best, most appropriate way for the City to fund these two mega projects?” I am not sure it is. It is my understanding that CRL's work best when the levy's pay for infrastructure projects that are the catalyst for private sector (tax paying) projects. Perhaps it is time to rethink how Community Revitalization Levy funds are used to ensure fairness to all Calgarians. Mayor Nenshi kicked off his 2017 re-election campaign announcing his bold vision for Culture and Entertainment District that not only included East Village, but Victoria Park, Stampede Park and the existing cultural district around Olympic Plaza. FYI: All of these ideas and projects were included in CMLC 2017 - 2019 Business Plan published earlier in the year. As my father of four used to say “If I give it to you, I have to give it to the other three.” While I realize not all communities are created equal (i.e. not all communities have the potential to attract $2.7 billion in new investments like East Village), I do think it might be time to rethink the RDCRL. Do CRLs create an uneven playing field for private developers in Calgary where they have to pay for all of the public amenities and pass on the cost to the new home buyers? Think Currie, Seton, Quarry Park or University District? And yes, I am envious of all the lovely amenities in East Village. I think many other Calgarians are too. 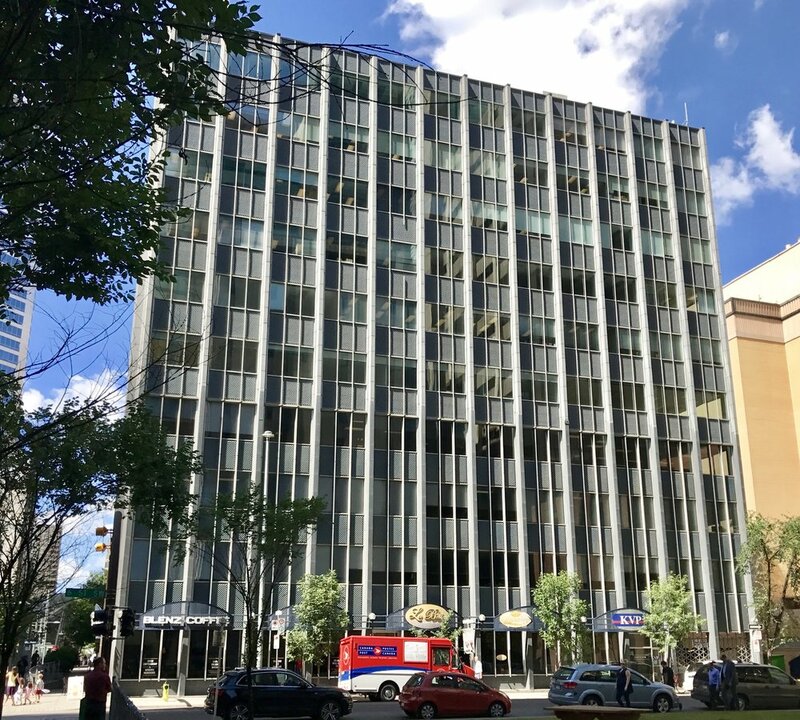 The BIG IDEA that arose from the City of Calgary’s “Downtown Economic Summit” this past March was the need to convert some of our downtown’s vacant office space into residential. Doing so would help create a more vibrant downtown in evenings and weekends when it tends to become a ghost town when the 150,000 downtown office workers leave. There are numerous smaller, older office buildings surrounding Hotchkiss Gardens in downtown Calgary, that could potentially be converted to residential. However, due to lack of parking, building code requirements and other factors many are not suitable for conversion. This idea is not new. 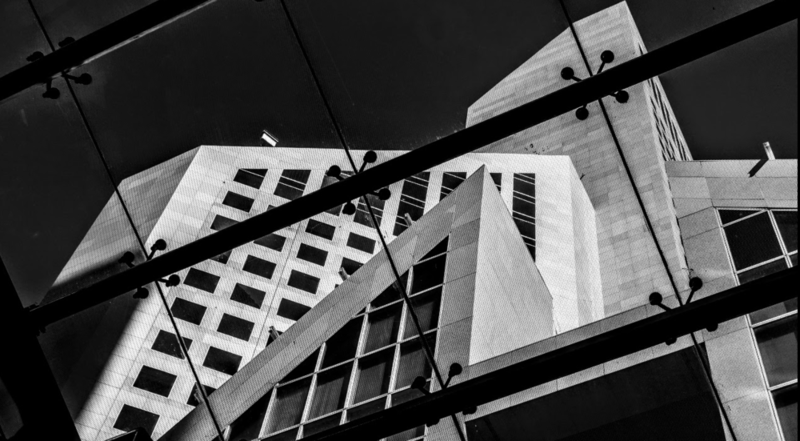 In the early ‘90s (also a time when Calgary’s downtown office vacancies were very high), Paul Maas, an architect and urban planner at the City of Calgary championed the idea that Calgary’s downtown core needed more residential development. He advocated for residential above the shops in the historic buildings along Stephen Avenue. He also thought old office buildings would make for ideal conversions to residential. His ideas fell on deaf ears, partly because at that time, there was no market for residential development in the core or surrounding \ communities. The Calgary Downtown Association even had an architect on staff for a time, researching the feasibility of office conversions to residential. His conclusion - conversions were too costly, complex and there was no market for residential in the core. Built in 1958, the owners of Sierra Place (7th Ave and 6th St. SW) have decided to convert the 92,000 sq.ft. of office space to 100 residential units. Fast forward to today. There has been an incredible renaissance in urban living, not only in Calgary but in major cities across North America for more than a decade now. Today, new residential buildings are routinely under construction in the communities surrounding our downtown - West Downtown, Eau Claire, East Village, Bridgeland/Riverside, Inglewood, Victoria Park, Beltline, Mission and Hillhurst. 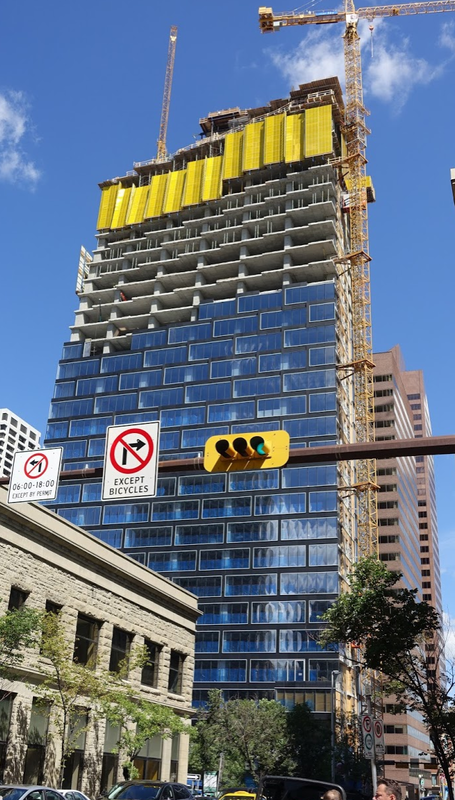 But in the downtown core itself (9th to 4th Ave SW and 8th St SW to Centre Street), there has only been two buildings with any residential component built since the ‘90s - Germain hotel, office, condo project and the TELUS Sky, currently under construction. Telus Sky currently under construction at 7th Avenue and Centre St. will have 422,000 sq.ft. of office space on the lower level and 341 residential units on the top floors. It has been designed by the world renown architecture firm Bjarke Ingels Group. 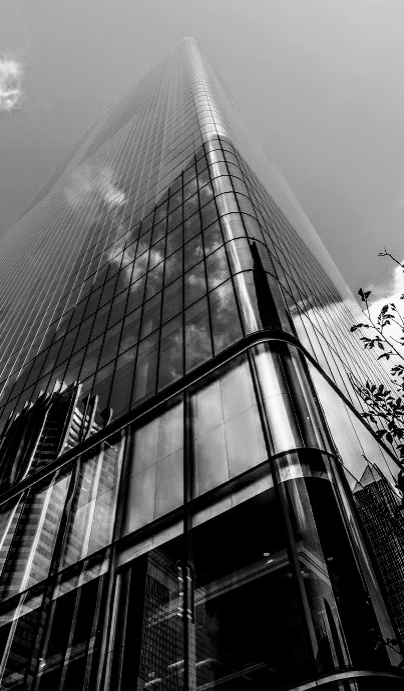 Over the years, numerous studies have documented the difficulties of office-to-residential conversions - building code issues, costs, lack of market and parking requirements being the key ones. 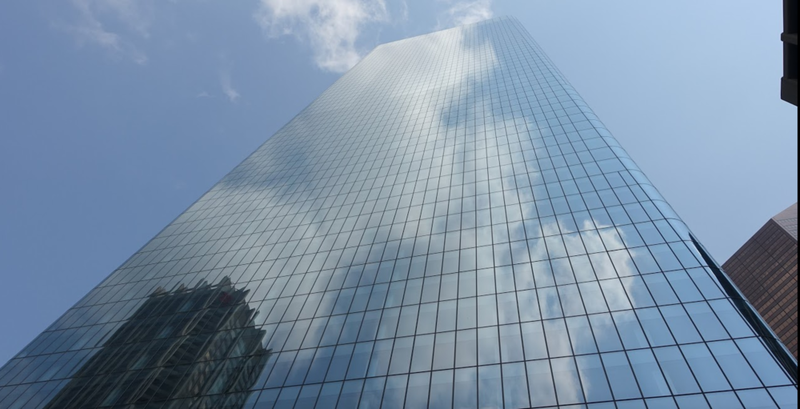 To get a current picture of the feasibility of office conversion in Calgary, I spoke with decided with Bruce McKenzie, Vice President, Business Development, NORR Calgary office as they have probably designed more urban residential buildings in Calgary than any other architectural firm. Inability to control construction costs due to unforeseen extras (renovation / code extras). Lack of parking means most likely these properties will remain rental (and probably should as people aren’t apt to take the risk of an old building and the potential future condo fee escalations). Mechanical systems are totally unusable from office to condo/rental so a total gut job is usually needed. Never able to achieve National Energy Code of Canada for buildings’ envelop requirements. Floor plate sizes are too deep to create usable residential space at appropriate scale i.e. smaller units, which are typically what the market wants in conversion buildings. That being said, NORR Calgary is currently doing several conversion studies, with one downtown Calgary project in working drawings. Rocky Mountain Plaza is another example of an older building that might be considered for conversion given it proximity to Olympic Plaza, Art Commons, Stephen Avenue Walk and Glenbow. I also connected with Strategic Group who owns a number of older buildings in downtown Calgary and are doing an office-to-residential conversion of the Harley Court building in downtown Edmonton. Older buildings along downtown's 7th Avenue are more attractive for conversions even though they lack parking, as they have excellent access to transit. 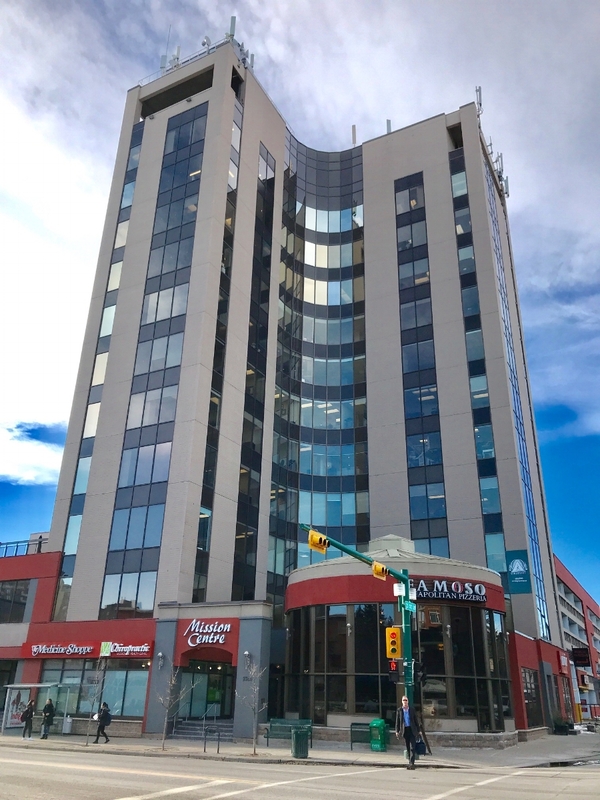 Recently, while surfing Twitter, I learned Winnipeg-based Artis REIT has proposed the redevelopment of Calgary’s Sierra Place (7th Ave and 5th St SW) office building to residential. Zeidler BKDI architects have recently submitted a development permit on their behalf, proposing to convert the ten-storey, 92,000 square foot building into a 72-suite residential building. Obviously, while converting old office buildings to residential is difficult, it is not impossible. The PanCanadian Building (located across from the Fairmont Palliser Hotel) has been renamed The Edison and is being marketed as a funky space for start-ups. Already Silicon Valley's RocketSpace has leased 75,000 sq.ft. for a co-working space that could accommodate as many as 1,000 start-ups. Calgary’s downtown office space vacancy problem is not with its older buildings, but rather with its tall shiny new buildings. Some quick math shows older office buildings (C Class) make up only 6% of the total downtown office space (or about 2.3 million square feet) of which 630,000 square feet is vacant. The conversion of three or four older office buildings will not solve our downtown office vacancy problem. On the other hand, Class A and AA office space (newer buildings, best location, best amenities) make up 72% of the total downtown office space. 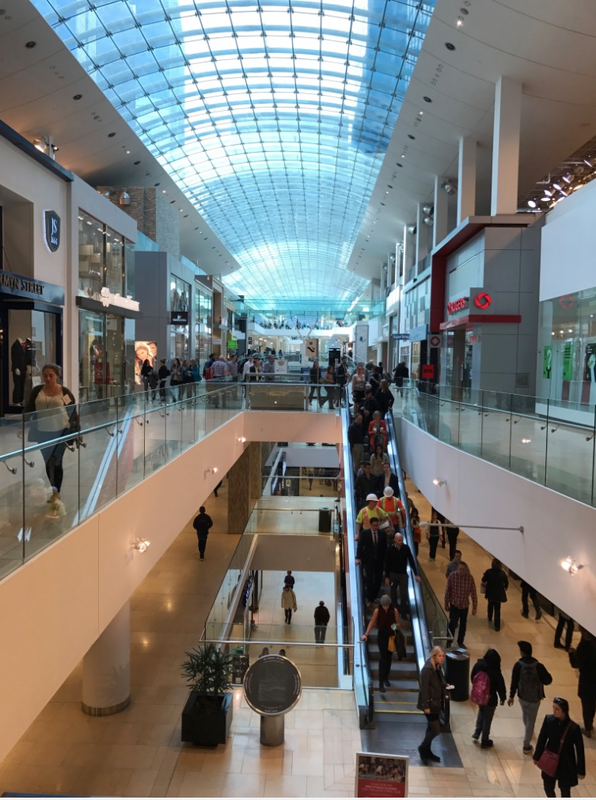 Currently, there is about 7 million square feet of vacant A and AA space (or about 65% of the total current vacant space – becoming higher with the completion of Brookfield Place and TELUS Sky). The reality is Class A or AA office buildings are not good candidates for conversions from both a design perspective and location, as well the owners (pension funds) have deep pockets and for them the best return on their investment is still as offices. At the beginning of 2017, Calgary has more office space under construction than any city in Canada, even more than Toronto. 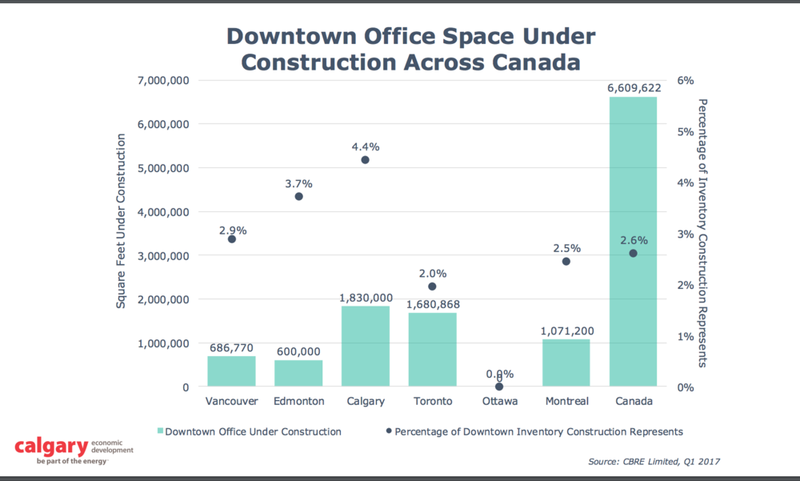 Downtown Calgary's office space surplus is the result of too much new construction over the past few years. 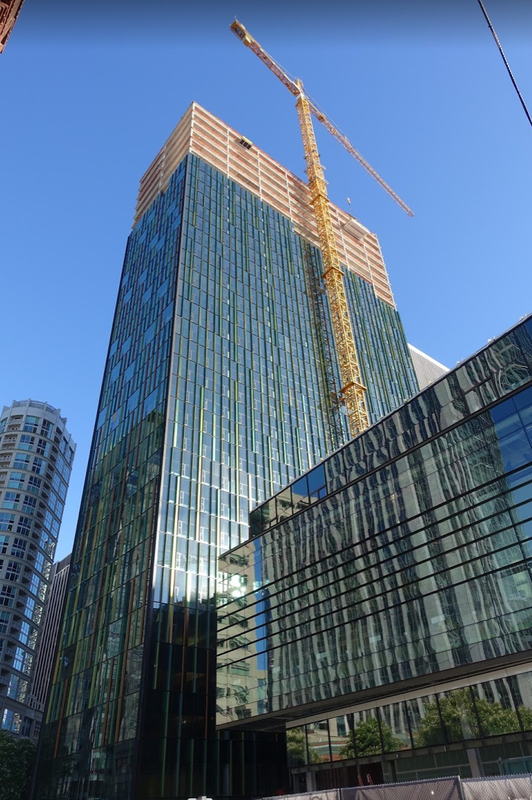 Just one of several new office towers being built for the Amazon campus in downtown Seattle. They are all quite spectacular. Also let’s not forget a healthy downtown needs older office buildings. They offer the cheaper rent and funky character spaces that are often very attractive to start-up business, i.e. the exact businesses we want to attract downtown to help diversify the economic base. Today’s start-up in a tired older office building could be tomorrow’s Amazon, which by the way, has created a funky, new multi-new building campus (9 million square feet in all) in downtown Seattle, for its 25,000+ employees. Office-to-residential conversions will not save our downtown! Note: An edited version of this blog was published in the Calgary Herald's New Condo section on September 30, 2017. Why Amazon might pick Calgary for HQ2? All downtowns must reinvent themselves. Amazon created a feeding frenzy when it announcement plans to open a second North American headquarters that would result in 50,000 new jobs and $5 billion in capital expenditures for the chosen city. Politicians, economic development CEOs and planners were busy tweeting out why their city should be the winner in the Amazon HQ2 Sweepstakes. Calgary's West Village approved redevelopment plan would fit perfectly with Amazon's plans for a second headquarters. The proposed Riverfront Promenade along the Bow River would become a vibrant 18/7 urban playground. West Village aka Amazon Village is the land between the Bow River and CPR railway tracks from Crowchild Trail to Mewata Armouries. Most of the land is owned by the city, which would allow them to negotiate a deal. 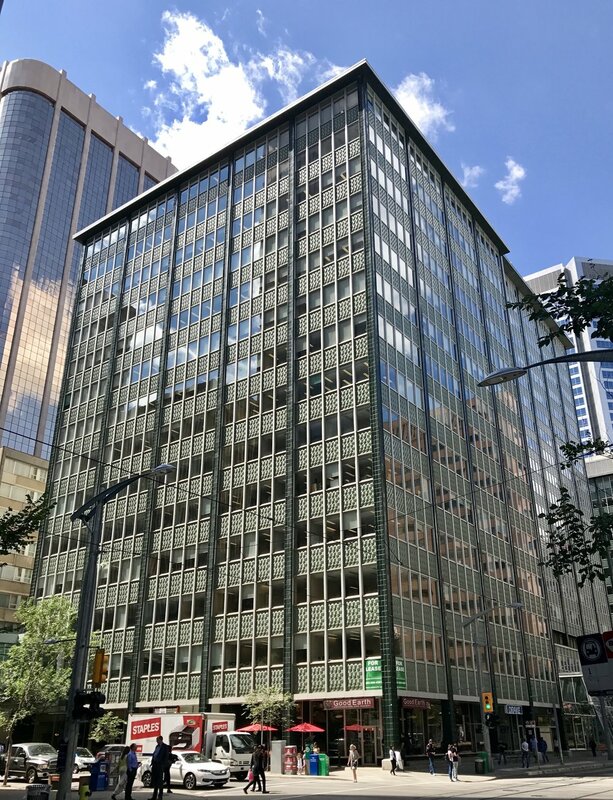 While it would be ideal if Amazon HQ2 could just take up the 10 million square feet of existing office space in downtown Calgary many of those buildings would be difficult to retro-fit for Amazon's needs. 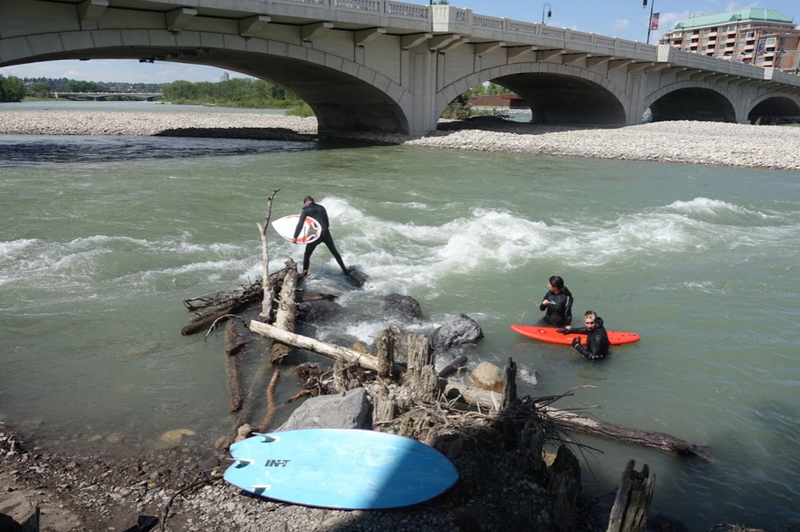 If Amazon chose West Village for HQ2 their employees could body surf in the Bow River at lunch and after work. Calgary Economic Development President and CEO, Mary Moran, quickly confirmed Calgary would be making a strong pitch to Amazon. "The value proposition that we offer aligns with what Amazon is looking for. This is an innovative city with a highly educated and globally connected workforce, we have affordable available real estate, low-cost of doing business, exceptional transportation links and quality of life for their employees,” said Moran. The West Village plan calls for several plaza and pedestrian oriented streets. The West Village plan envisions mid and high-rise buildings with a mix of uses to create street vitality daytime and evenings, weekdays and weekends. Calgarians of all ages love to test their strength and agility wherever and whenever they can. This just happens to be under the LRT bridge linking downtown to Kensington Village. The New York Times went so far as to pick the perfect city for Amazon HQ2. From 25 cities, they short-listed Portland, Denver, Washington and Boston areas, then. picked Denver as the winner. Brookings Institute picked Charlotte N.C., Bloomberg thought Boston was the best choice and Creative class guru Richard Florida is betting on Washington, D.C. The only city in Canada that got any real attention in the scramble to predict a winner in the Amazon HQ2 Sweepstakes was Toronto. 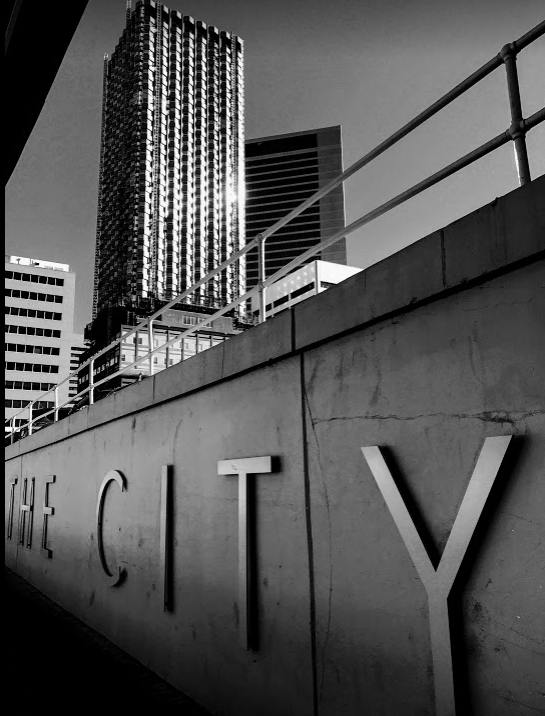 Then Jens Von Bergmann posted “Amazon – The Canadian Data” on twitter, looking at Amazon’s HQ2 requirements and Canadian cities and guess who came out on top – Calgary. Link: Amazon- The Canadian Data. 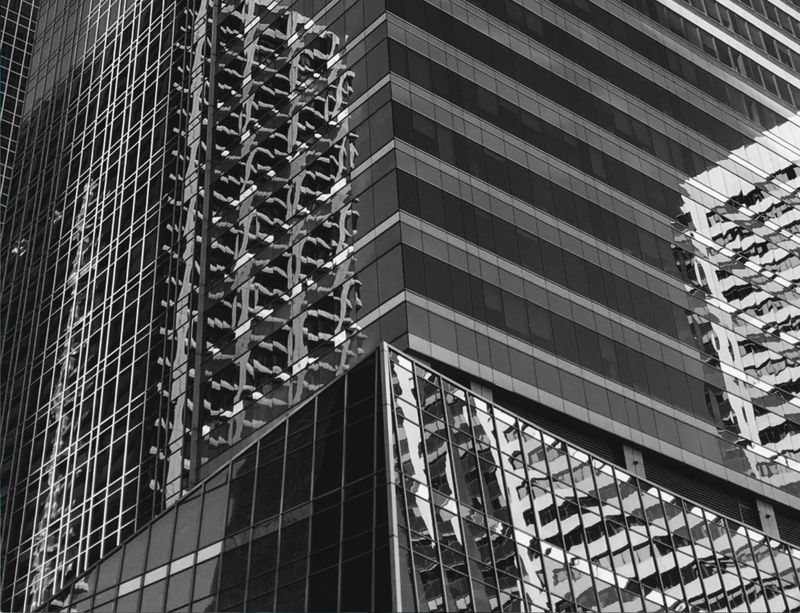 Calgary's downtown has one of North America's largest collection of corporate headquarters (oil&gas, financial, accounting and law firms) located in over 42 million square feet of office space. Downtown's Stephen Avenue Walk takes on a festival atmosphere at lunch when 20,000+ workers pour out of the offices along the Walk. Stephen Avenue is a National Historic District. After reviewing Amazon’s Request for Proposals (RFP), here are my thoughts on why Calgary would be a good fit for Amazon HQ2. I will not address all of the technical issues and of course I can’t comment on what incentives our municipal, provincial or federal government might be able to give, which will be huge factor in their decision. Rather, I will focus on three key areas identified in the RFP as important factors in Amazon’s decision: Thinking Big, Urban Living and Unique Culture. Calgary's bike culture dates back to 1869. Calgary's higher education goes back over 100 years at SAIT where the past meets the future. 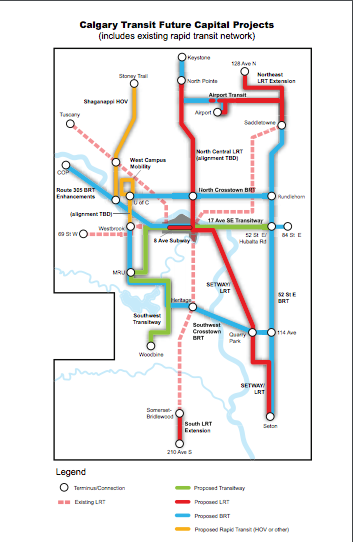 Calgary was an early adopter (1981) of LRT as a core element of its city-wide transit system, long before Seattle, Denver or any American city for that matter. Today Calgary has the highest per capita LRT ridership in North America and with the development of the Green Line (46 kilometers, 28 stations, serving 27 communities) it will also have one of longest. In addition, Calgary is currently constructing two BRT routes as part of its ambitious rapid transit vision. And, if that isn’t enough, in 2001, our LRT became the first wind-powered public transit system in North America. Calgary has an ambitious transit vision. 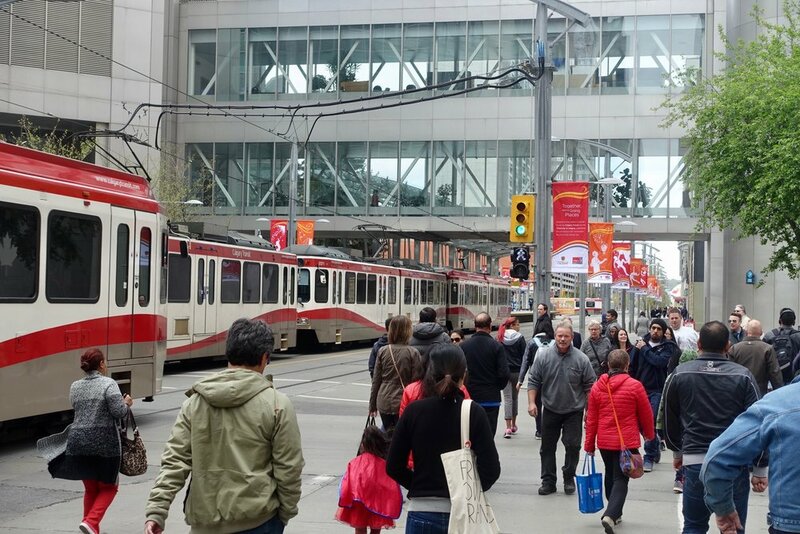 Downtown's 7th Avenue Transit Corridor is the hub for Calgary's transit system. Calgary is also the cleanest city in the world as a result of our commitment to state-of-the-art water treatment plants. According to the Mercer Global Financial list, Calgary has been the world’s cleanest city in the world for several years now based on: availability and drinkability of water, waste removal, quality of sewage system, air quality and traffic congestion. Calgary, the largest logistic hub in Western Canada and one of the largest inland ports in North America, fits perfectly with Amazon’s operations. Calgary also thinks big when it comes to parks and pathways. 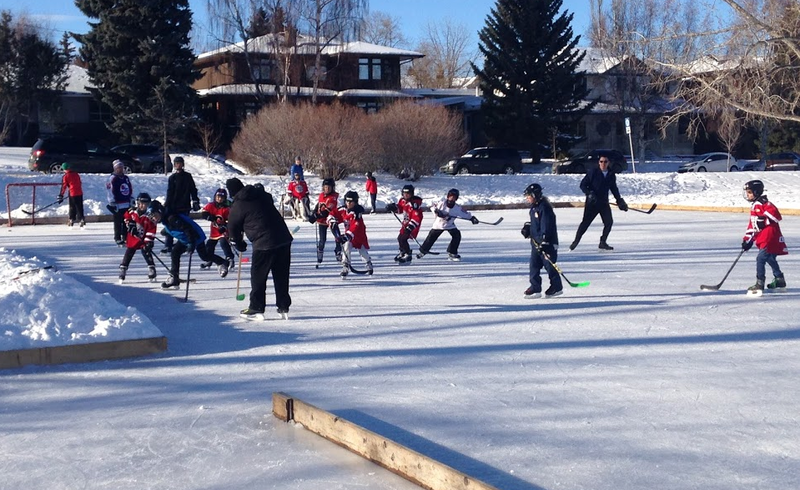 We have over 5,200 parks, including two of the largest urban parks in the world – Fish Creek (13.5 sq. km) and Nose Hill (11 sq. km). Calgary has 150 public off-leash areas across the city. Our three City Centre island parks (Prince’s, St. Patrick’s and St. George’s) in the middle of the Bow River are spectacular urban oasis. And don’t forget our easy access Banff National Park and Kananaskis Provincial Park. Calgary's 138 km Rotary/Mattamy Greenway circles the city. And yes we are working on the completion of a ring road around the city also. 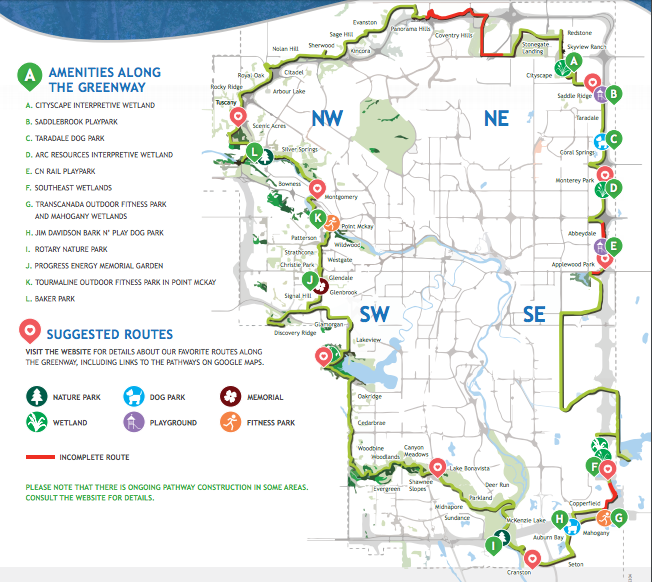 In addition to our City Centre bike lanes (something asked for in the RFP) we also have over 1,000 km of pathways city-wide including the new 138 km Rotary/Mattamy Greenway that encircles the city connecting over 400,000 Calgarians. Calgary is a cyclist’s paradise for commuters and recreational cyclists. 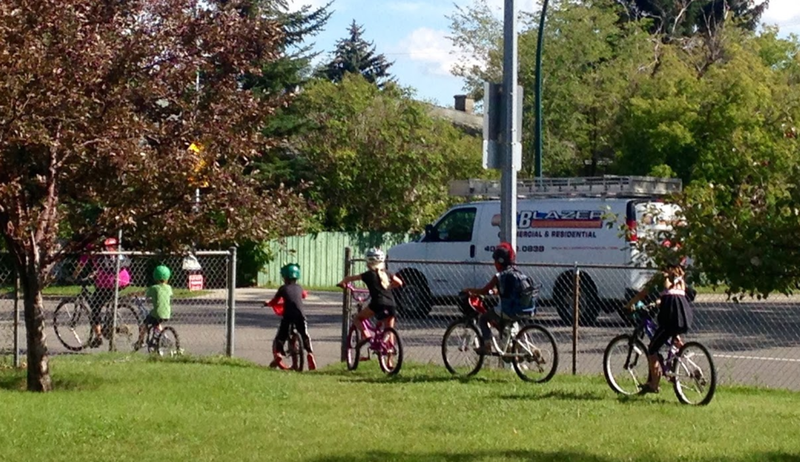 Calgarians of all ages love to cycle. Bow Cycle is one of the largest bike shops in the world. It sponsors the annual Tour de Bowness race. As well, Calgary is currently building four mega recreation facilities (to the tune of almost half a billion dollars) – Rocky Ridge, Seton, Great Plains and Quarry Park. The iconic Repsol Sports Center (formerly the Talisman Centre) with its iconic Teflon-coated semi-transparent fibreglass dinosaur-like roof is the second most used recreation facility in North America attracting over 1.8 million visitors annually. It opened in 1983 and was the catalyst for creating mega, multi-use recreation centers across the city. The Crescent Heights stairs are a popular spot for Calgarians to challenge their fitness levels. With 167 steps divided into 11 flights, most people find once is enough. But there is fun challenge on the internet, based on 10 laps starting at the bottom and finishing at the top. Under 17 minutes = olympian, 17 – 20 minutes = professional, top amateur, 20 – 24 minutes = very athletic. There is a walk or run in Calgary almost every weekend for charity. Yes we love our hockey. Calgarians also love their rivers - Bow and Elbow. 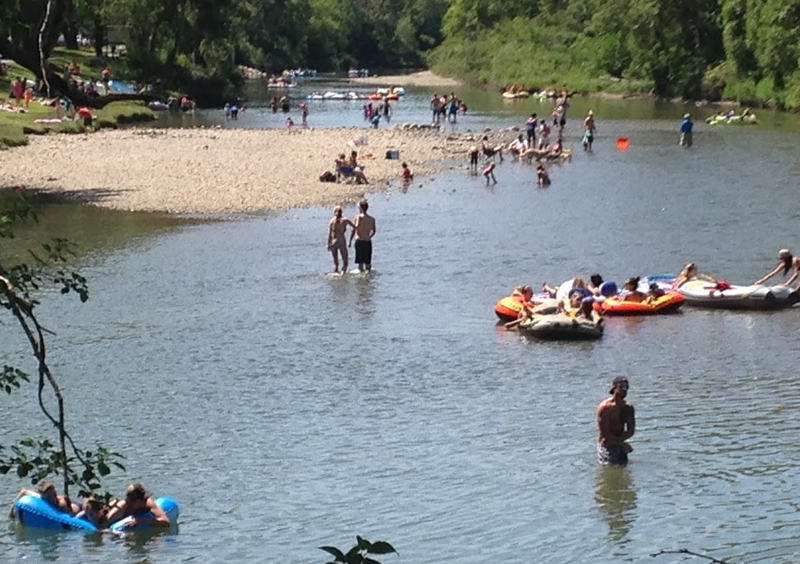 This scene is repeated 25+ times along the two rivers from May to September. Having visited Seattle, Denver, Portland and Austin recently, none of those cities can match Calgary’s amazing infill housing development occurring in our City Centre and inner-city communities. Tour any community within 10 km of Calgary’s downtown and you will find old homes being torn down and new family homes being built in their place on almost every block. You will also find dozens of multi-family buildings being built at strategic locations. And, Calgary currently has seven mega new urban villages in various stages of construction in our inner city – Bridges, Currie, East Village, Eau Claire, Stadium, University District and University City/Brentwood. In addition, Inglewood was chosen as “Canada’s Greatest Neighbourhood” by the Canadian Institute of Planners and Kensington was short-listed in 2014 (both communities have improved since then). Add in the Beltline (the hipster capital of North America), Chinatown, Erlton, Mission, Ramsay and Sunalta and Calgary offers some of the most diverse and affordable urban living options in North America - from penthouses to micro-condos, from single-family infills to mansions, from transit-oriented living (N3 condo in East Village has no parking) to walking and cycling-oriented living. All at affordable prices compared to most major North American cities. Impromptu couples dancing in Tomkins Park in RED (Retail, Entertainment District). Calgary has a very strong independent coffee/cafe culture that dates back to the '70s. 17th Avenue aka The Red Mile is a popular people watching and dining and beer drinking hot spot. Kensington Village has a vibrant street culture as the Alberta College of Art & Design and Southern Alberta Institute of Technology are nearby. It is full of cafes, shops, restaurants and an arthouse movie theatre. There is even a cat cafe. 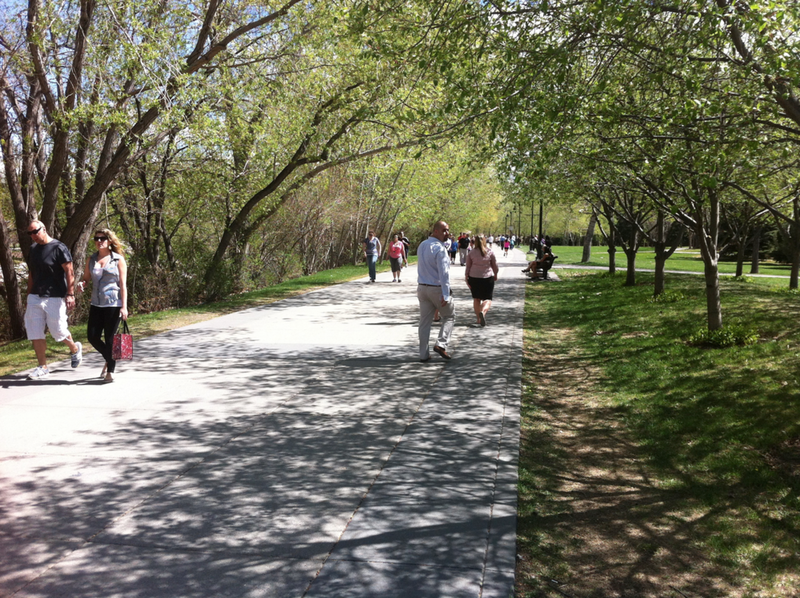 The Bow River pathway on the edge of downtown is a popular spot for walking, cycling and running weekdays and weekends. You can find new condos on almost every other block in Calgary's Beltline community. 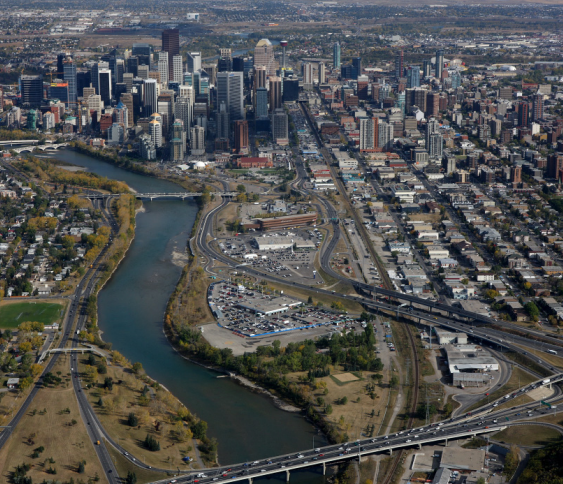 It is Calgary's most dense and diverse community with 22,000+ residents. East Village is a new master planned urban village on the east side of downtown, when completed in 2027 it will be home to 12,000+ residents. Calgary already has over 70,000 people living in its City Centre. Calgary boast one of the most diverse inner city living options of any major city in North America, from mansions to cottages, from high-rises to mid-rises, from duplexes to row homes. There is new construction on almost every other block within 10 km of downtown Calgary. Calgary is home to one of North America’s most unique annual festivals – Beakerhead. It is a smash up of science, engineering, technology, innovation, art and culture that takes place at multiple sites across the city. In 2017, there are 14 sites that area expected to attract over 125,000 participants over five days. It is exactly the kind of funky, futuristic, techy stuff Amazon loves. The Calgary Comic and Entertainment Expo is Canada’s second largest comic-com event attracting over 100,000 visitors. Theatre Sports, the precursor to the current improve theatre craze was invented in Calgary, at the University of Calgary in 1977. Calgary is quickly becoming a major music city with the opening of the National Music Centre. 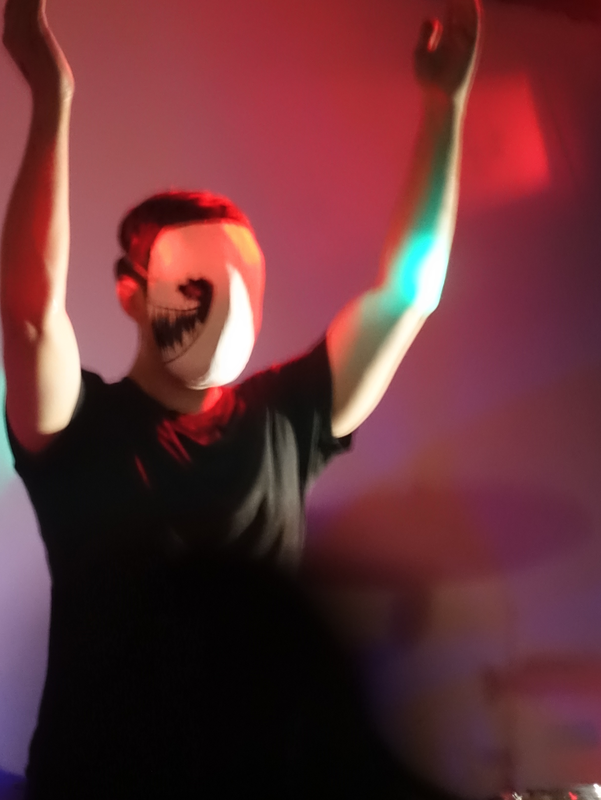 We also have several major music festivals including Calgary International Folk Festival, Sled Island and the Performing Arts Festival (4,000 entries, 12,000 participants, makes one of the largest amateur competition music festivals in North America). The Honens Piano Competition is one of the world’s most prestigious events of its kind in the world. Cowtown Opera Company takes their satirical performances to the streets and shopping malls of the city. Calgary’s High Performance Rodeo has been showcasing the best in contemporary international performance every January since 1986. In 2017, it featured 28 shows over 32 days with 150 performances by 200 artists from around the world. Calgary’s Lunchbox Theatre is North America’s longest running lunchtime theatre company. Calgary’s unique culture also includes an amazing diversity of recreational opportunities from speed skating to show jumping. Spruce Meadows is one of the best equestrian centres in the world and Shaw Millennium Park has one of the largest public skate parks in North America. Canada Olympic Park offers unique recreational experiences - downhill skiing, zip line, mountain biking, luge and bobsled. Calgary’s Olympic Oval has the fastest speeedskating ice in the world. In the winter Calgary boasts over 100 outdoor community skating rinks. 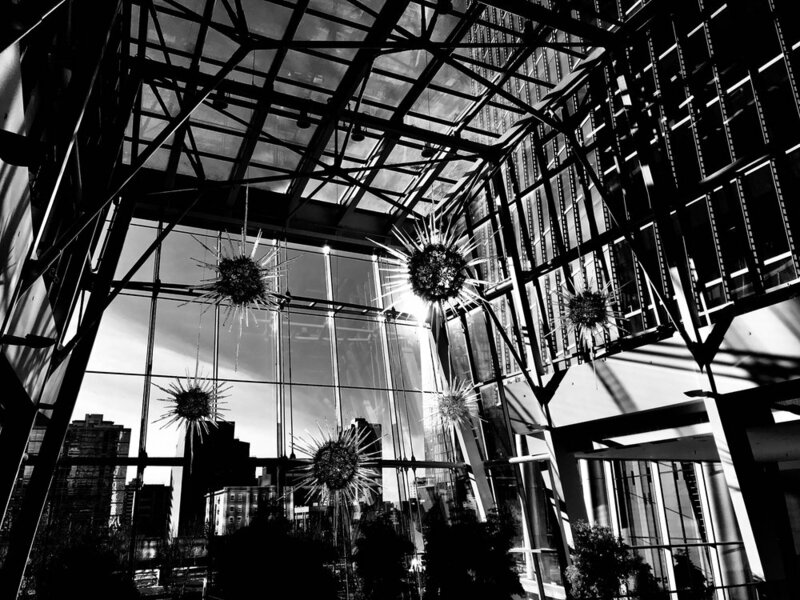 Beakerhead festival celebrates the connections between art, science and engineer every September. Prince's Island's signature event is the Calgary International Folk Festival. There are festivals and special outdoor events every weekend in the City Centre. When Amazon announced they were looking to set up a second headquarters, they indicated that it could be anywhere in North America. While most crystal ball gazers are assuming they will choose an American city, given the current political and social upheaval in the USA, Canada could well be a safe haven for Amazon. Calgary is probably the most American friendly city in Canada. We have a strong entrepreneurial, business-oriented, future thinking culture, while at the same time having a strong community spirit. In 2016, Calgarians donated $55 million to United Way, the highest per capita United Way contribution in North America. West Village has parks at both ends along with beautiful Bow River waterfront linear park. Millennium Park has one of the world's largest public skateboard parks in the world, which would be very appealing to Amazon employees. It is also home to many festivals. The West Village Master Plan calls for four major landmark artworks, several urban plazas as well as open space and natural areas, making it ideal for the Amazon HQ2 campus. The West Village Master Plan has a campus feel to it that would be ideal for Amazon HQ2. It would be easy to phase in the development based on the existing area redevelopment plan. Amazon's plan is to duplicate their downtown Seattle HQ over time in another city. In many ways, Calgary has retained all that is good about the pioneer culture that created our city just over 100 years ago. While Calgary is a long shot to win the Amazon HQ2 headquarters, everyone loves an underdog. FYI: Calgary may have a little insider help. James Gosling, a Calgarian and University of Calgary grad, who invented the Java computer language found on 97 per cent of enterprise computer systems and virtual-machine systems, joined Amazon in May 2017. And yes Calgary has an observation tower - ours is just a bit taller and yours a bit older. We could be sister cities. If you haven’t been to the renovated three storey, sandstone King Edward School (1720 – 30th Ave SW) in Marda Loop you must go. The handsome building was completed in 1913 and was one of 19 sandstone schools built by the Calgary public school board between 1894 and 1914.
cSpace is currently hosting the provocative "I Am Western" art exhibition which is a "must see" for anyone interested in the visual arts and social commentary. While cSPACE is still a work in progress (the school renovation is finished and 29 artists and art groups are all in, but they are still constructing the new performance space and completing the front yard landscaping). You can already see how the juxtaposition of the old and new is creating something very special both for Calgary’s creative community and the public. The majestic King Edward School is getting a new life as a creative hub. The construction on the left side is the new performance space. The site will also include luxury condos on the west side and a seniors complex on the east. There is a bit of an urgency to go before Oct 1st 2017 as the well worth seeing exhibition “I Am Western” closes then. I hope these postcards from our recent visit will entice you (and maybe bring some friends) to visit both the space and the exhibition before the end of September. It’s FREE! Lyndal Osborne and Sherri Chaba, The Space Between Cities, 2011 is a mixed media installation that resembles a small tool or garden shed. It includes fossils, wasp nests, antlers, furniture, digital images, pelts, grain seedlings, paddle, bird nest, bird wing, sunflower roots and much much more. The artists intent is for the viewer to "meditate upon the constant transformation of our world." Loved this shed-like structure full of fun everyday artifacts from the farm. Especially liked this beehive made from old matchbooks. John Freeman, Now You See It Soon You Won't, 2011, inkjet in on translucent polyester fabric. This tryptic that combines image word association "Rye-Food," "Grain-Same" and "Canola-Same" with images of prairie agriculture. Be sure to check out the stairwells, as they are full of fun artworks - don't take the elevator. Kids will love these. People of all ages and backgrounds will enjoy the Chagall-like mural. Kelly Johner, The Three Sirens: For The Love of Bling, Prairie Song, Belle of the Bale, 2014. The artist's materials relate to the land or to activities on the farm but are given new purpose and meaning - saddles become female silhouettes, bale twine is crocheted into a dress by her mother and horse tack and heel rope become a hoop skirt. Below are some close-up views of The Three Sirens. Maybe plan your trip on a Saturday, so you can stop by the Marda Loop Farmers’ Market (at the nearby Community Centre parking lot) and pick up a coffee and perhaps a treat (there is no café at cSPACE) before heading to the school. Also note the Alberta Craft Council gallery isn’t open until noon; so don’t get there too early. Alberta Craft Council's boutique is a great place to find a unique gift. They also have an art gallery the showcases the work of Alberta craft persons. Love this magazine rack with a sample of the many great magazines published in Alberta. It provided us with good reading for the rest of the weekend. Even if the studios aren't open you can still look inside and see some of the interesting art being produced. 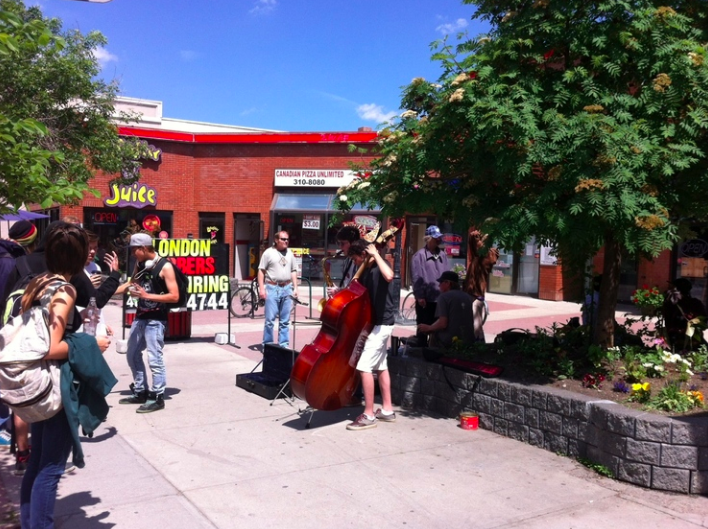 Marda Loop Farmers' Market fun. Urban Design: Does the public care? Does the average Calgarian really care about urban design? David Down, Architect and Chief Urban Designer at the City of Calgary thinks we do. SETON Gateway structure is just one example how Calgary developers are paying more attention to the importance of urban design. The Gateway was designed by Allen DeBoer at Calgary's Gibbs Gage architects and paid for entirely by Brookfield Residential. A good example of Calgary's improved urban design can be found in the Beltline with Barb Scott Park (12th Ave and 9th St SW), designed by Calgary's Scatliff+Miller+Murray landscape architects. The park includes Chinook Arch ($370,000) a public artwork by Joe O'Connell and Blessing Hancock from Tucson, AZ. Kudos should go to the Beltline community who spear headed the development of this park (cost $3 million). Across the street are two colourful modern apartments designed by NORR's Calgary office, and are good examples of the enhance urban design of residential towers in Calgary today. The new 8th St SW underpass ($8.8 million) transformed a tired and crumbling old pedestrian corridor used by over 8,000 pedestrians a day to a hip, modern walkway. The lead desinger was Renee Daoust at architecture et urbaniste, in Montreal, working with a local team consisting of Marshall Tittemore, Scattlif+Miller+Murray and Watt Consulting. 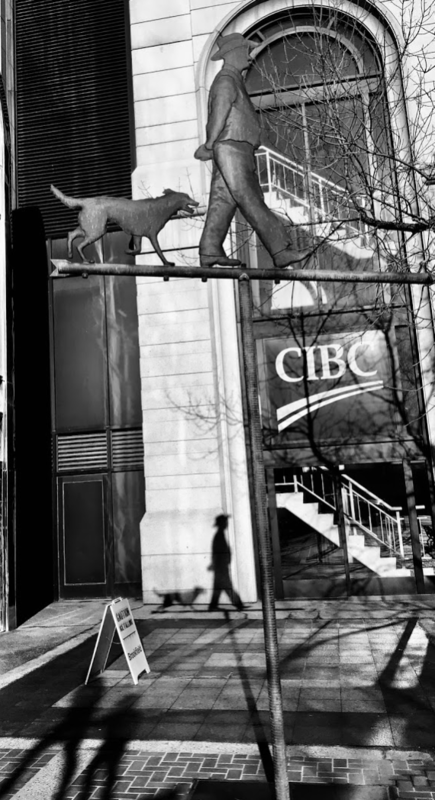 Toronto artist David Rokeby created "Calgary Scroll" the electronic sign board that connects one side of the sidewalk to the other with rolling text of stories from Calgary's past. You can text to 587-318-0092 key word and see what stories come up. Public art has become an important part of all suburban LRT stations in Calgary. Down feels the level of public interest in urban design has increased significantly over the last decade and it is not just an interest in mega projects like the Peace Bridge, Bow Tower or TELUS Sky, but at the residential level as well. “There is now, more than ever, a critical mass of residential buildings, both single and multi family, designed by both large and small local architectural firms, which are pushing the design envelope in a way that didn’t exist in the late 20th century. In addition, new public forums focussing on urban design like Dtalks and Baconfest are attracting capacity crowds,” points out Down. “Calgary has undergone significant positive physical change over the past ten years in the quality of the design of its buildings, streets and public spaces and the improvements are continuing to occur,” he notes. “Also Calgary’s improved urban design is beginning to be recognized globally” adds Down, “for example, Calgary will be hosting the prestigious Walk21 September 19 to 22 (previous locations for this conference include Vienna, Berlin, Melbourne and Hong Kong).” Calgary will also host the International Play Association World Conference September 13 to 17th. Poppy Plaza was designed by Caglary's Marc Boutin Architcture Collective. RiverWalk was designed by Stantec's Calgary office as one of the kick off projects to the transformation of East Village from a derelict to a dynamic community. This project cost $23 million. Urban design is the design of individual buildings, groups of buildings, master planning of new communities, redevelopment of established communities, as well as the design of parks, plazas, pathways, public art and streetscapes. It is an inter-disciplinary practice that includes architects, landscape architects, planners, engineers and community engagement. Denver based Civitas, and New York based W Architecture, have transformed St. Patrick’s Island into a charming urban playground with a pebble beach, picnic grove, pathways, playgrounds, plaza and private places to sit. Cost of the redevelopment was $45M, which includes $25M for a new pedestrian bridge to the island. 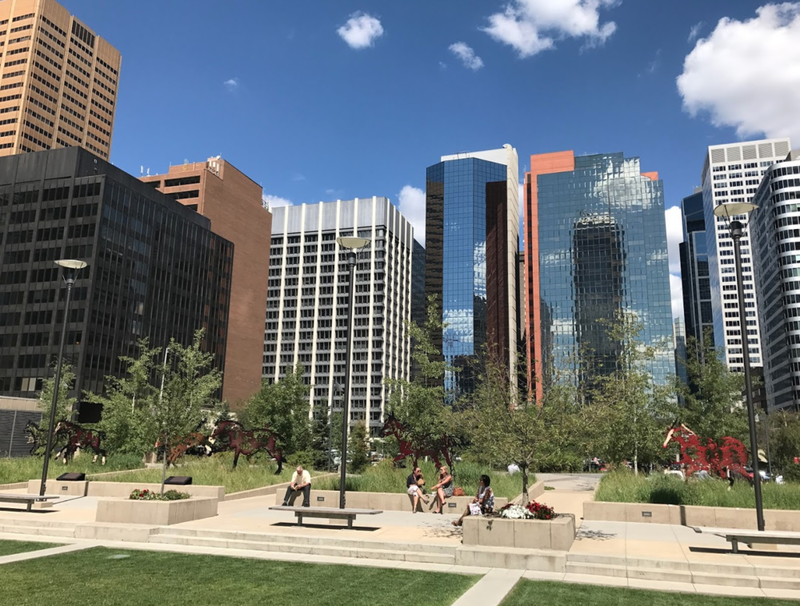 The first evidence of the rise in importance of urban design in Calgary came in 2003 when the City created an “Urban Design Review Panel” to review major City Centre projects to ensure they would enhance the quality of living for Calgarians. Then, in 2005, the City hired David Down as Senior Architect/Urban Designer to advocate for better urban design within the Planning Department. Also in 2005, the Royal Architectural Institute of Canada (RAIC) instituted the Urban Design Awards program, inviting Canadian cities to participate in a two-tiered (in odd years there is a local award competition; in even years the local winners are eligible for national awards) Urban Design Award program to recognize excellence in urban design in Canada and demonstrate its importance to the general public at both the local and national levels. Both David Watson, then General Manager of the City’s Planning Department and then Mayor Dave Bronconnier were supportive of the staff’s request to join the RAIC program. Calgary became one of first cities to join the program. Stephen Avenue pedestrian mall which dates back to 1970 was one of Calgary's first attempts in modern times to employ the new urban design philosophy of "pedestrians first." Two years earlier, in 2014, The Marc Boutin Architectural Collaborative Inc. won the national Civic Design Projects Award for “The Landscape of Memory: Poppy Plaza” project. And in 2012, Broadway Malyan with Roland Berger Strategy Consultants won for their East Village Master Plan in the same category. In 2010, Stantec Consulting Ltd. won a national award in the category of Urban Design Plans for The River Walk Master Plan. The futuristic looking new Rocky Ridge Recreation Center is a absolutely stunning was designed by Calgary's GEC architecture, who also designed the Saddledome and Olympic Oval. Cost $191M. How the Mayor’s Urban Design Awards Program Works? David Down, the City of Calgary’s Chief Urban Designer, in collaboration with the Mayor’s office, manages the program. Anyone can make a submission for consideration by the jury, but it is usually someone from the project team who submits. Detailed submission requirements are on the City of Calgary website (link http://calgary.ca/PDA/pd/Pages/Mayors-Urban-Design-Awards/Mayor-Urban-Design-Awards.aspx?redirect=/muda). In any given year, about 50 to 60 submissions are received. Suggestions for jury members are solicited from a group of design industry “advisors” and a list is created of experts from the fields of urban design, architecture, landscape architecture, planning, community advocacy, arts and media. Jury members are from Calgary and elsewhere to ensure a balance of local knowledge and “outside” best practice experience. Not all new public art is controversial, this piece by Saskatchewan artist Joe Fafard is the centre piece for the Hotchkiss Gardens. Below the garden is a 700 stall parking garage. This artwork and installation cost $500,000 and was paid for by donations from an individual and corporation. Over the past 15 years, Calgary's SAIT campus has added numerous modern buildings like the Johnson-Cobbe Energy Centre designed by Calgary's Gibbs Gage Architects. The RAIC determines the categories, which includes some strange and ambiguous names like Civic Design Projects, Approved or Adopted Urban Design Plans, Conceptual/Theoretical Urban Design Projects, Urban Fragments, Student Projects and Urban Architecture. 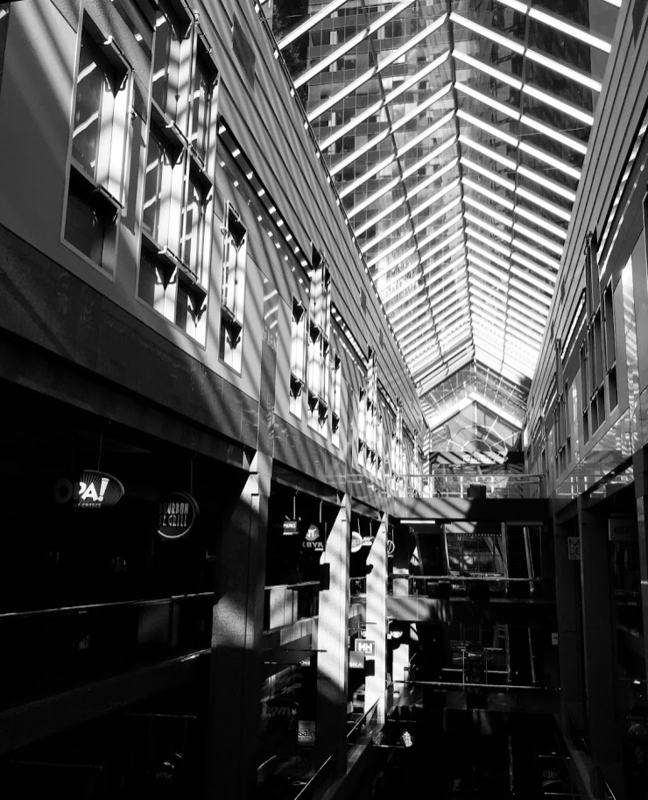 Building(s) that achieve urban design excellence and creativity through awareness of the Calgary culture. Urban design plans, architecture and landscape designs that respond to needs in newly developing areas of the city (This award was created to encourage more suburban projects submissions as in the past, the awards were very City Centre-centric). Building and infrastructure designs, urban design plans, landscape designs, planning studies and individual site elements that contribute to the quality of life in Calgary. Building(s) that achieve sustainable design while seeking to reduce energy and resource consumption of buildings. I am told there will also be a People’s Choice award this year, but the City is still working out the details. The deadline for all submissions is September 5, 2017, with the gala awards ceremony happening on November 15, 2017. Down thinks (and I agree) that over the past decade, Calgary’s local urban design community - with the assistance of signature international designers - have created a critical mass of good urban design projects that have captured the attention of the international design community. Diverse projects, like the futuristic Rocky Ridge Recreational Centre, the stunning SAIT Polytechnic Parkade, the glowing SETON Gateway feature, the playful Alberta Children’s Hospital and St. Patrick’s Island all demonstrate how Calgary’s suburbs, inner city and City Center communities are all experiencing enhanced urban design projects. The days of the public accepting a boring concrete box building are history. It will be very interesting to hear what urban design professionals from around the world think of our city when they visit this September. Stay tuned! Note: An edited version of this blog appeared in the Calgary Herald's New Condos section on Saturday, August 12, 2017. Calgary is NOT on the cusp of becoming a "design city!" While most Calgarians head west on the weekend, being the contrarians we tend to be, we headed east, on a recent Friday morning, with our ultimate destination being The ‘Hat (aka Medicine Hat). Driving the back roads, we quickly wondered why we don’t do this every weekend – I could have stopped a dozen times to take photos. The entrance to Blackfoot Crossing Historical Park interpretive centre is both stunning and powerful. Medicine Hat's railway underpass is a provocative street art gallery that would be right at home in Berlin. We had to stop in Gleichen for old times’ sake – having lived there from 1981 to 1985. Not much has changed; it is as if time stood still – and a sad reminder of the decline of small prairie towns everywhere. Our house is still there, looking pretty much the same, though worse for wear. No evidence remains of the “Street Art For Gleichen” project I initiated – the murals are all faded away or painted over and the art park is now Beaupre Park with the historic water tower, a buffalo sculpture and a few picnic tables. Backstory: The “Street Art For Gleichen” project was just as controversial in Gleichen as Bowfort Towers is in Calgary today. In fact, a key issue was one of the artists used indigenous motifs without any consultation with the Siksika Nation just across the tracks. I was so naïve. We weren’t planning a stop in Cluny on our way to Blackfoot Crossing but when we saw Pete’s Bakery and the folk art junkyard across the street the car came to a screeching halt. After ogling the extra large cookies, we chose Pete’s strudel, which we ate while wandering around the junkyard resisting the urge to grab a souvenir for our yard. Pete's cookies and strudel - WOW 50 cents and a Loonie. How could resist? Five minutes further south on Highway 842 from Cluny is Blackfoot Crossing (Soyopowahko means Blackfoot in their language), a designated national Heritage Site. Its interpretive centre not only documents the complexity of the Treaty Seven (which was signed nearby), but the way of life of the Blackfoot people. The setting is spectacular - on the edge of a cliff looking out over the Bow River Valley. Upon entering the exhibition area you encounter the entire Treaty Seven reproduced on large illuminated glass panels that form a huge circle in the middle of the exhibition space. (FYI. The original Treaty Seven document is currently located at Fort Calgary). The sheer length and “legalese” language make one wonder if the Chiefs could really have fully understood what they were signing. It was sobering. My biggest disappointed was that photo taking was not allowed in the exhibition area. This surprised me given most galleries and museums today allow photos without flashes. I realize some of the pieces might be sacred, but a significant free marketing opportunity is lost as people today love to take photos and post them on Twitter, Instagram and Facebook. We were also puzzled why the Centre is only open Monday to Friday. With Calgary as their biggest market, you would think being open Wednesday to Sunday would make more sense. Why not one weekend per month? We were the only ones there during our 90-minute visit. There is a short walking trail near the interpretive centre where you will find more interpretive panels and a high point for viewing. I also found what looked like old sweat lodges nearby. There are longer walking trails but most of the interpretive information was destroyed in the 2013 flood and have not been replaced. You can also book over night stays in a teepee. Next stop - the world’s tallest tepee (20 storeys tall), originally constructed for Calgary’s 1988 Winter Olympics and located at McMahon Stadium for the opening and closing ceremonies, is now installed in Medicine Hat. This very impressive structure is located on the edge of the Seven Persons coulee, that includes one of the best Northern Plains archaeological sites – the Saamis Archaeological Site. It is believed 83 million artifacts are buried at the site. I have no idea how they can make this estimate. Backstory: The name “Medicine Hat” is the English translation of Saamis (SA-MUS), the Blackfoot word for the eagle tail feather headdress worn by medicine men. The white ghost-like tepee with its 10 large storyboards, explains the history of the area from prehistoric times to the present. Several large circular paintings help create an informative outdoor museum/art gallery. We didn’t do the self-guided walking tour of the archaeological site. Next time. I couldn’t help but wonder why Calgary didn’t keep the tepee as a legacy of the Olympics. It would have been a great addition to Fort Calgary, which was an important gathering place for First Nations. It could also have been installed on Nose Hill, another important First Nations site. It would have been a spectacular site lit up at night. Medicine Hat's win; Calgary's loss. Bonus: Be sure to check out the Visitor Center near the tepee - they have an abundance of great information, as well as FREE bikes. Yep, just give them your ID information, leave your vehicle there and quickly you are off exploring the 150+ km of trails in the city. Next time? Medicine Hats lovely turn-of-the-century historic downtown is a fun place to flaneur. Two of our stops were thrift stores – but unfortunately, we didn’t unearth any treasures. However we did find the world’s largest chess set (behind the Library) and if we had more time, we would have played a game. Most regular Everyday Tourist readers know we love finding off the beaten path spots when we visit a city. In Medicine Hat’s case, it was a small, outdoor shopping mall along Dumore Road SE. Driving by, we spotted a window full of brightly coloured circles. We had to stop. Soon we were inside Rings & Things, a funky accessories/gift/home décor shop with the largest collection of UMBRA products we have ever seen. Turns out the quirky display was made of coloured Styrofoam plates – how simple; how clever. Also in the mall was McBrides Bakery a Medicine Hat institution, unfortunately it was closed on Friday night when we discovered Rings & Things, so we headed back first thing Saturday morning. It is famous for its giant apple fritters and tasty croissants. Definitely worth the trip back - and a “must visit” when in The ‘Hat (not far off the TransCanada Highway, it might even be worth a stop if just passing through). Also in the mall was an interesting home décor store Kerry Jayms Lighting and Décor and (on good authority) Dress Your Lashes Fashion Accessories is also worth a visit. Too much to see and do…too little time! The ’Hat has retained some of its mid-century motel charm along the TransCanada Highway. We enjoyed our stayed at the Travelodge with its coloured silhouette running lights that give it a bit of a Las Vegas vibe at night. It was very popular with families with its pool with a waterslide. Not sure why but we got the huge family room with two queen beds and a bunk bed with double on bottom, but it would be perfect for a family travelling with a grandparent or two. I was told the colour of these running lights can be changed to allow them to celebrate special events or to recognize the colours of visiting sports teams staying at the Lodge. Anybody know what dataport is? Entering the Saturday farmers’ market at Medicine Hat’s Rodeo Grounds is like entering a different culture with the presence of Hutterites from several colonies selling their vegetables. We arrived early and unbeknownst to us, we entered through a side door (we later learned it was for vendors) and had the place to ourselves for about 20 minutes. We had no idea that there were probably 100 people lined up to get in at the public entrance. We not only loved the great produce at great prices, but the sellers mostly young Hutterite women, with their charming demeanour and colourful dresses. Note: Wouldn’t it be great if the Calgary Stampede could find a way to host a weekend market at Stampede Park from after Stampede to Thanksgiving? After all, it started as an agricultural fair. This place is huge…would be very fun to be there in the spring when its full of bedding out plants. Still, it was fun to look at the perennials and the garden giftware. The Butterfly Garden was a bit of a disappointment as there were only a few butterflies when we visited. I was told they get a fresh shipment of butterflies about every two weeks with the number and variety of varying each time. Too bad the admission price doesn’t vary with the number of butterflies on view. If butterflies are your thing, check when they are getting their shipment and time your visit accordingly. Medicine Hat had three things going for it that lead to it producing 75% of Canada’s pottery products early in the 20th century. First, a ready supply of natural gas provided a reliable source of heat for the kilns. Second, an abundant supply of clay (for centuries the South Saskatchewan River deposited alluvial silt along its banks. As early as 1885 these clays deposits were tested for their brick-making potential and found to be of excellent quality. Third, the railway was right there enabling easy shipping across the country. Though, many of the clay products factories in Medicine Hat were small businesses, two large-scale plants dominated the industry - Medicine Hat Brick & Tile and Alberta Clay Products. Today, Medalta is the setting for a living, working museum, vibrant education centre, contemporary art gallery and 12,000 square foot contemporary ceramics studio for visiting artists from around the world. Give yourself at least two hours to take the tour, then explore the museum and wander the site. If you happen to be in Medicine Hat on a Thursday in the summer – bonus! A vibrant farmers’ market (4:30 to 8:30pm) on site includes food trucks, artisans, live music and a bar. Backstory: One of our reasons for this trip was see if we could get more information on set of vintage “Jill” pattern plates by Hycroft as an exhaustive Google search yielded no information. While we couldn’t get any help from the weekend staff, we were given a name and contact information, who provided much helpful information. Do we keep them or Kijiji them, that is the question? For nature walk purists, there is Police Point Park, a 400-acre natural reserve bordered on three sides by the South Saskatchewan River. One of its signature attractions is its ancient, gnarled (the result of past floods) cottonwood trees. Great for photos and bird watching. Downy and Hairy Woodpeckers, American Kestrel, Juncos, House Finches, Bald Eagles, Blue Herons and several types of owls have all been seen. LOCAL - best patio and great beer. Lots of shade - critical when summer temperatures are routinely above 30 degrees in a city boasting 330 days of sunshine. Inspire – bright charming corner bistro / art gallery. Good soups, salads, sandwiches and desserts. We are still drooling over the carrot cake. Thai Orchid Room - we didn’t make it to the Orchid but we have it on good authority (including CBC restaurant reviewer John Gilchrist) it is outstanding. He loved the extensive, traditional, authentic menu with an extensive tea list and great service, rating it 8 out of 10. Heartwood – located in the old Eaton’s store downtown, the soups are to “die for” (signature soup is roasted red pepper and tomato) and staff is very friendly. Note: Not open weekends. Station Coffee – best spot for a coffee, popular breakfast spot, good vibe, gluten free and vegetarian options - get there early. Hot tip: try the caramel latte. If you live in Calgary, next time you are considering a (long) day road trip or weekend getaway, consider The ‘Hat. If you are passing through on the TransCanada Highway, give yourself some time to explore the city. Meeting Creek: Ghost Town Meets Artist Colony? This past May there were two important ground breaking events in the evolution of Calgary’s condo culture AVLI on Atlantic in Inglewood and The Residences of King Edward in Marda Loop. While both communities have seen their fair share of new condos and infill homes over the past 10 years, are the first truly luxury condos to be built outside Calgary’s City Centre. AVLI on Atlantic by Greenwood Developments was designed by one of Calgary’s most respected architects - Jeremy Sturgess. He was part of the design team for the Bow Tower, Water Centre, in Manchester and the redesign of downtown’s 7th Avenue Transit Corridor. He is known for his contemporary design that goes to the edge but never falls into the school of “wacky architecture.” Sturgess has been creating interesting condos since the early ‘90s - his Connaught Gardens, completed in 1991 listed on the Alberta Association of Architects’ Chronicle of Significant Alberta Architecture. For AVLI on Atlantic, Sturgess and his team seems to have been inspired by the renowned 20th century prairie architect Frank Lloyd Wright whose signature was flat roof homes with strong horizontal lines (inspired by the horizon line that dominates the prairie landscape), large windows and commitment to craftsmanship. The 7-storey AVLI has a cool white South Miami Beach look, with large triangular balconies that seem to float off of the building. It has the look of a modern piece of sculpture and will contrast nicely with the contemporary warehouse look of the Atlantic Avenue Art Block across the street with its wave roof. Together, they will create a contemporary 21st century sense of place synergistic with the Inglewood’s historic Main Street from the early 20th century. The “AVLI on Atlantic” name is derived from the fact it is located on 9th Avenue whose historic name is Atlantic Avenue, with “avli” being Greek for courtyard and the developers are Greek. “The Residences of King Edward” is the next phase in an ambitious redevelopment of the iconic sandstone King Edward School site that has been vacant since the ‘90s. 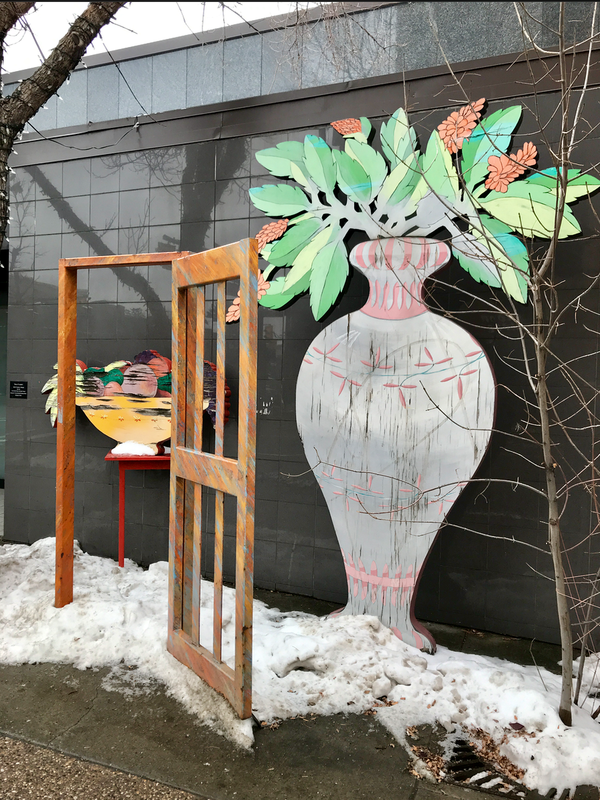 Earlier this year, artists and other creative types began moving into the studio/work spaces and in May, the Alberta Craft Council moved into its gallery space. Later this year, a multi-purpose 150-seat theatre space will open. Jenkins cleverly designed the building’s façade to look like a series of attached infills, allowing it to visually fit nicely into the community’s existing single-family home streetscape. In reality, it is a 3-storey condo building, with units ranging in size from 1,400 to 3,600 sq. ft. It is “bungalow living” in a condo. There is also a sense of craftsmanship in the combination of materials that includes sandstone, stucco and zinc cladding, giving it both a contemporary and traditional look. Jenkins too has employed Frank Lloyd Wright’s strong horizontal lines and interplay of different materials to create a building that has character and charm. 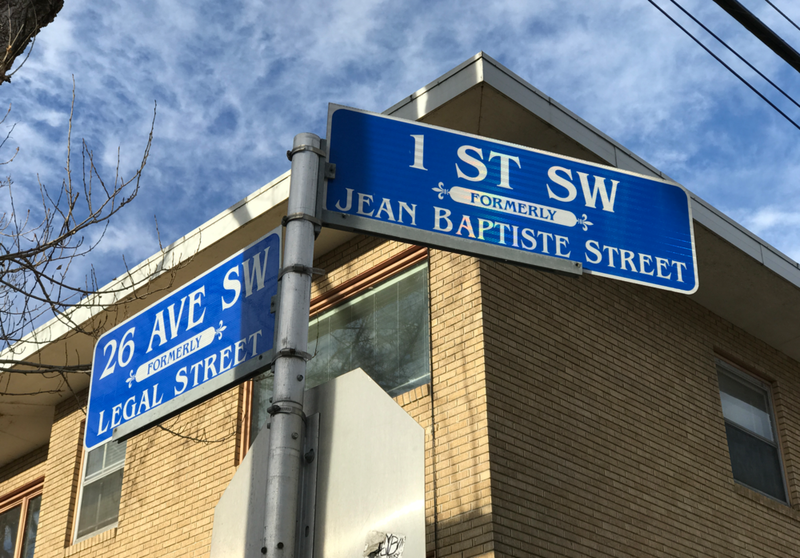 The Residences of King Edward are located along 17th St SW, from 29th to 30th Ave SW. The scale and design is very compatible with the new infills homes that are transforming the neighbourhood into a vibrant 21st century community. The fact two experienced Calgary developers are moving forward with these luxury condo projects at this time is strong evidence Calgarians are embracing condo living. It also shows Calgary’s economy is stronger than some may think. This blog was commissioned for my Condoscapes column in the July 2017 edition of Condo Living Magazine. Are School Site Sacred Cows?